They include crops and animals believed to have originated from the Hemudu and Majiabang cultures in the hypothetical proto-Austronesian homelands in mainland China, as well as other plants and animals believed to have been first domesticated from within Taiwan, Island Southeast Asia, and New Guinea. Some of these plants are sometimes also known as "canoe plants", especially in the context of the Polynesian migrations. Domesticated animals and plants introduced during historic times are not included. The candlenut (Aleurites moluccanus) was first domesticated in Island Southeast Asia. Remains of harvested candlenuts have been recovered from archaeological sites in Timor and Morotai in eastern Indonesia, dated to around 13,000 BP and 11,000 BP respectively. Archaeological evidence of candlenut cultivation is also found in Neolithic sites of the Toalean culture in southern Sulawesi dated to around 3,700 to 2,300 BP. Candlenut were widely introduced into the Pacific Islands by early Austronesian voyagers and became naturalized to high volcanic islands. Candlenut has a very wide range of uses and every part of the tree can be harvested. They were primarily cultivated for the high oil content in their nut kernels. They were used widely for illumination, prior to the introduction of other light sources, hence the name "candlenut". The kernels were skewered on coconut midribs that were then set alight. Each kernel takes about three minutes to burn and thus the series could act as a torch. This tradition of making candlenut torches exist in both Southeast Asia and Oceania. Candlenut oil extracted from the nuts can also be used directly in lamps. They can also be utilized in the production of soaps, ointments, and as preservatives for fishing gear. Other traditional uses include using the timber for making small canoes and carvings; the sap for varnish and resins; the nut shells for ornamentation (most notably as leis), fish-hooks, toys, and the production of black dyes; the bark for medicine and fiber; and so on. Some non-toxic varieties are also used as condiments or ingredients in the cuisines of Southeast Asia and the Pacific. 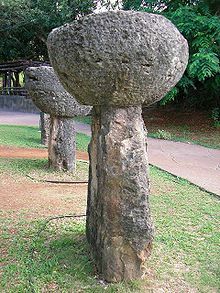 The Proto-Austronesian word for candlenut is reconstructed as *kamiri, with modern cognates including Hanunó'o, Iban, and Sundanese kamiri; Javanese and Malay kemiri; and Tetun kamii. However the Oceanian words for candlenut is believed to be derived instead from Proto-Austronesian *CuSuR which became Proto-Malayo-Polynesian *tuhuR, originally meaning "string together, as beads", referring to the construction of the candlenut torches. It became Proto-Eastern-Malayo-Polynesian and Proto-Oceanic *tuRi which is then reduplicated. Modern cognates including Fijian, Tongan, Rarotongan, and Niue tui-tui; and Hawaiin kui-kui or kukui. 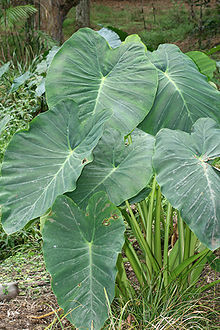 The giant taro (Alocasia macrorrhizos) was originally domesticated in the Philippines, but are known from wild specimens to early Austronesians in Taiwan. From the Philippines, they spread outwards to the rest of Island Southeast Asia and eastward to Oceania where it became one of the staple crops of Pacific Islanders. They are one of the four main species of aroids (taros) cultivated by Austronesians primarily as a source of starch, the others being Amorphophallus paeoniifolius, Colocasia esculenta, and Cyrtosperma merkusii, each with multiple cultivated varieties. Their leaves and stems are also edible if cooked thoroughly, though this is rarely done for giant taro as it contains higher amounts of raphides which cause itching. The reconstructed word for giant taro in Proto-Austronesian is *biRaq, which became Proto-Oceanic *piRaq. Modern cognates for it in Island Southeast Asia and Micronesia include Rukai vi'a or bi'a; Ifugao bila; Ilocano, Cebuano, and Bikol biga; Tiruray bira; Ngaju biha; Malagasy via; Malay and Acehnese birah; Mongondow biga; Palauan bísə; Chamorro piga; Bima wia; Roti and Tetun fia; Asilulu hila; and Kowiai fira. In Oceania, cognates for it include Wuvulu and Aua pia; Motu and 'Are'are hira; Kilivila and Fijian via; and Hawaiian pia. Note that in some cases, the cognates have shifted to mean other types of taro. The elephant foot yam (Amorphophallus paeoniifolius) is used as food in Island Southeast Asia, Mainland Southeast Asia, and South Asia. Its origin and center of domestication was formerly considered to be India, where it is most widely utilized as a food resource in recent times. But a genetic study in 2017 have shown that Indian populations of elephant foot yams have lower genetic diversity than those in Island Southeast Asia, therefore it is now believed that elephant foot yams originated from Island Southeast Asia and spread westwards into Thailand and India, resulting in three independent domestication events. From Island Southeast Asia, they were also spread even further west into Madagascar, and eastwards to coastal New Guinea and Oceania by Austronesians. Though they may have spread south into Australia without human intervention. The elephant foot yam is one of the four main species of aroids (taros) cultivated by Austronesians primarily as a source of starch, the others being Alocasia macrorrhizos, Colocasia esculenta, and Cyrtosperma merkusii, each with multiple cultivated varieties. Elephant foot yam, however, is the least important among the four and was likely only eaten as a famine crop, since they contain more raphides that cause irritation if not cooked thoroughly. Numerous species of Artocarpus are traditionally cultivated or harvested from semi-domesticated or wild populations in Island Southeast Asia and Micronesia for food, timber, traditional medicine, and other uses. They include Artocarpus anisophyllus (entawak), Artocarpus heterophyllus (jackfruit or nangka), Artocarpus integer (cempedak), Artocarpus lacucha (lakuch), Artocarpus mariannensis (Marianas breadfruit), Artocarpus odoratissimus (tarap or marang), and Artocarpus treculianus (tipuho), among many others. The most important species pertaining to the Austronesian expansion however, are Artocarpus camansi (breadnut or seeded breadfruit) and Artocarpus altilis (breadfruit). According to DNA fingerprinting studies, the wild seeded ancestor of Artocarpus altilis is the Artocarpus camansi, which is native to New Guinea, the Maluku Islands, and the Philippines. A. camansi was domesticated and selectively bred in Polynesia, giving rise to the mostly seedless Artocarpus altilis. Micronesian breadfruit also show evidence of hybridization with the native Artocarpus mariannensis, while most Polynesian and Melanesian cultivars do not. This indicates that Micronesia was initially colonized separately from Polynesia and Melanesia through two different migration events which later came into contact with each other in eastern Micronesia. The reconstructed Proto-Malayo-Polynesian word for breadfruit is *kuluʀ, which became Proto-Oceanic *kulur and Proto-Polynesian *kulu. Modern cognates include Malay and Javanese kulur or kelur; Acehnese kulu; Iban kurur; Cebuano kulo or kolo; Muna kula; Mussau ulu; Kapingamarangi gulu; Wayan Fijian kulu; Emae kuro; Tuamotuan, Takuu, and Rarotongan kuru; Tahitian ʻuru; Samoan and Hawaiian ʻulu; and Māori kuru. Note that in Māori, kuru is only mentioned in tradition, but does not refer to the plant because breadfruit did not survive into Aotearoa. Also note that it is believed that breadfruit only reached western Island Southeast Asia (Java, Sumatra, Malay Peninsula) during the recent centuries, as a result of trade with the Maluku Islands. Another notable reconstructed word for breadfruit is Proto-Oceanic *maRi or *mai. It is a common root for words for breadfruit in Micronesia, northern and western New Guinea, the Solomon Islands, the Admiralty Islands, St Matthias Islands, New Caledonia, and parts of the Central Pacific. The term itself may have originally been for Artocarpus mariannensis instead of Artocarpus altilis. Cognates include Pohnpeian, Mokil, and Ngatik māi; Palauan, Satawal, and Tuvaluan mai; Puluwat mais; Yapese maiyah; and Tongan, Niuean, and Marquesan mei. The jackfruit, (Artocarpus heterophyllus) was domesticated independently in South Asia and Southeast Asia, as evidenced by the fact that the Southeast Asian names for the fruit are not derived from the Sanskrit roots. It was probably first domesticated by Austronesians in Java or the Malay Peninsula. The word for jackfruit in Proto-Western-Malayo-Polynesian is reconstructed as *laŋkaq. Modern cognates include Javanese, Malay, Balinese, and Cebuano nangka; Tagalog, Pangasinan, Bikol and Ilocano langka; Chamorro lanka or nanka; Kelabit nakan; Wolio nangke; Ibaloi dangka; and Lun Dayeh laka. Note, however, that the fruit was only recently introduced to Guam via Filipino settlers when both were part of the Spanish Empire. Various species of bamboo (subfamily Bambusoideae) are found throughout Island Southeast Asia, Mainland Southeast Asia, East Asia, and South Asia. In Austronesian regions, different types of bamboos have different names, as well as the products made from them. They are used variously as building materials, fishing gear, musical instruments, knives, water and food vessels, and so on. Bamboo shoots are also a food source in Southeast Asia. A few species of bamboo were carried by Austronesian settlers as they colonized the Pacific islands. They include the ʻohe (Schizostachyum glaucifolium), the common bamboo (Bambusa vulgaris), and the thorny bamboo (Bambusa bambos). Reconstructed Proto-Austronesian words that referred to bamboo include *qauR, *kawayan, *buluq, and *betung. The latter entered Proto-Malayo-Polynesian and Proto-Oceanic as *bitung, with cognates including Malay awi bitung; Fijian bitu; and Tongan pitu. Most terms for bamboo in Polynesia, however, originated from Proto-South-Central-Pacific *kofe (originally from Proto-Polynesian *kofe, "root"). Modern cognates include Tongan and Niue kofe; Tokelau, Marquesan, Tuamotuan, and Māori kohe; Rarotongan koʻe; Samoan and Tahitian ʻofe; and Hawaiian ʻohe. Some names have also shifted refer to bamboo-like plants; especially in islands where they were not introduced into or did not survive, like in Aotearoa. Paper mulberry (Broussonetia papyrifera), better known as "tapa cloth tree" in the Pacific, originates from subtropical regions in mainland Asia and is one of the best evidence for the mainstream "Out of Taiwan" hypothesis of the Austronesian expansion. Various genetic studies have traced the origins of paper mulberry populations in the Remote Pacific all the way to Taiwan via New Guinea and Sulawesi. In the Philippines, which was along the expansion path, paper mulberry are mostly descendants of modern introductions in 1935. It is presumed that ancient introductions of paper mulberry went extinct in prehistory due to its replacement with hand-woven fabrics, given that paper mulberry generally only survives under human cultivation. However, its absence in the Philippines further underlines its origins in Taiwan, and not within Island Southeast Asia. Additionally paper mulberry populations in New Guinea also show genetic inflow from another expansion out of Indochina and South China. It is believed to be the most widely transported fiber crop in prehistory, having been transported along with the full range of the Austronesian expansion, as opposed to most of the other commensal crops in Oceania. Paper mullbery is present in almost every island or island group in Polynesia, including Rapa Nui and Aotearoa. Some populations have gone recently extinct after they stopped being cultivated, like in the Cook Islands and Mangareva, although accounts and prepared barkcloth and herbarium specimens of them exist in museum collections gathered by Europeans during the Colonial Period. They were spread by Polynesians primarily through vegetative propagation with cuttings and root shoots. They were rarely cultivated from seeds as most plants were harvested prior to flowering, when the stems reach around 1 in (2.5 cm) in diameter, as described by 18th century European accounts. It is also unknown if the feral plants reproduced sexually as the plants are dioecious and require both male and female specimens to be present in one island. Paper mulberry is primarily used in the Pacific Islands to make barkcloth (tapa in most Polynesian languages). Barkcloth, can also be made from other members of the mulberry family (Moraceae), including Ficus (figs) and Artocarpus. Barkcloth was also occasionally made from Pipturus nettles, especially in Hawaii. However the highest quality of barkcloth was from paper mulberry. Barkcloth was mainly used for clothing among ancient Austronesians and is traditionally made using characteristic stone or wooden beaters which are among the most common artifacts found in Austronesian archaeological sites. Numerous archaeological remains of barkcloth beaters in southern China has been regarded as evidence that the pre-Taiwan Austronesian homelands were located in the region prior to the southward expansion of the Han Dynasty, particularly around the Pearl River Delta. The oldest such remains is from the Dingmo Site in Guangxi, dated to around 7,900 BP. Barkcloth remained an important source of clothing fabrics in pre-colonial Melanesia, Polynesia, and parts of Indonesia. However, it has been mostly replaced by woven fiber clothing in most of Island Southeast Asia and Micronesia. There are numerous names for paper mulberry throughout Austronesia, the most general can be reconstructed to Proto-Central Eastern Malayo-Polynesian *malaw, which also refers to the loincloth and other items of clothing made from paper mulberry bark. Its cognates including Selaru mal; Asilulu mala ai; Buli māl; Numfor mār; Tanga, Tolai, and Gedaged mal; Rennellese mago; Kairiru myal; Lusi, Kove, Manam, Gitua, Mota, Niue, Futunan, Samoan, Tuvaluan, Nukuoro, Anuta, and Hawaiian malo; and Arosi, Rarotongan, and Maōri maro. In Eastern Polynesia, terms for paper mulberry can also be reconstructed to Proto-Central Eastern-Polynesian *aute, with cognates including Tahitian and Rarotongan ʻaute; Marquesan ute; Hawaiian wauke; Rapa and Maōri aute. In most of Polynesia, the term for barkcloth can also be reconstructed from Proto-Nuclear-Polynesian *taba, meaning "bark", with cognates including Wayan taba; Tongan, Samoan, Mangareva, and Rarotongan tapa; and Hawaiian kapa. Other terms widely used for barkcloth and paper mulberry are derived from the Proto-Polynesian reconstructed word *siapo, with cognates including Niue, Tongan, and Marquesan hiapo; and Samoan and East Futunan siapo. The term for barkcloth beater, however, can be reconstructed more extensively back to Proto-Malayo-Polynesian *ike, with cognates including Uma ike; Sa'a iki; Bauan, Tongan, and East Futunan ike; and Samoan and Hawaiian iʻe. Mastwood (Calophyllum inophyllum) is a widespread timber tree native to tropical Asia. It is notable for its ability to grow to massive sizes in sandy or rocky beaches of island and coastal habitats, as well as its habit of sending out arching large trunks over the water where its seeds are dispersed via the currents. Due to these characters, mastwood are of particular importance to traditional shipbuilding of the larger Austronesian outrigger ships and were carried with them as they migrated to Oceania and Madagascar. Other species of the genus Calophyllum were also used similarly, like Calophyllum soulattri, Calophyllum peekelii, and Calophyllum goniocarpum. The wood grain of the members of the genus are characteristically interlocked, which make them harder to work with but also makes them stronger as well as being more suitable for carving intricate shapes. They were comparable in importance to how oaks were in European shipbuilding and timber industries. In many parts of Polynesia, mastwood groves planted in marae were considered sacred and abodes of spirits. Mastwood were also carved into religious objects like tiki. They are also commonly mentioned in the chants and folklore of Polynesia. Various parts of the mastwood were integral to the manufacture of outrigger canoes. The large curving limbs were commonly carved into the dugout canoes that formed the keel of the Austronesian outriggers ships. The strakes, which are attached to the keel by the uniquely Austronesian technique of "sewing" them with a combination of dowels and lashed lugs instead of nails, can also be made from mastwood, but it is more commonly made from other "softer" timber species like Artocarpus. Other pieces became masts, outrigger floats, and outrigger spars. Smaller curving limbs can also be carved into the ribs of the boat. Aside from shipbuilding, tamanu oil extracted from the fruit kernels were important in Polynesian culture. The oils, as well as poultices made from leaves and flowers, are also commonly used for traditional medicine. The leaves contain compounds that are poisonous to fish and can be used as fish poison. The reconstructed Proto-Austronesian word for mastwood is *bitaquR, with modern cognates including Ilocano bittáug; Ifugao bitául; Bikol, Cebuano, Maranao, Mansaka and Manobo bitáʻog or bitaʻug; Nias bito; Palauan btáʻəs; Wetan witora; and Asilulu hataul. The Western Malayo-Polynesian words for mastwood is derived from the doublet Proto-Austronesian *bintaŋuR, with cognates including Iban, Malay, Toba Batak, and Javanese bintangur or bentangur; Tontemboan wintangor; and Malagasy vintáno. In Proto-Oceanic, the reconstructed word is pitaquR, with cognates including Nauna pitɨ; Loniu pitow; Nali pirow; Seimat hita; Aua piʻaw; Pohnpeian isou; Rotuman hefau; Fijian vetau, Tongan fetaʻu; Niue, Samoan, and Tuvaluan fetau; Nukuoro hedau; and Rennellese hetaʻu. In most of these languages, the name specifically refers to C. inophyllum, although in Ifugao, Maranao, Nias, Wetan, and Fijian, the name has become more generalized to large timber trees. Another set of cognates for C. inophyllum in Proto-Oceanic can be reconstructed as *tamanu. Its difference from *pitaquR is unclear, but given the distinction between the terms in the Mussau reflex, *tamanu probably originally referred to specimens of the tree that grow in island interiors and not on the coastlines. Modern cognates include Mussau, Tongan, Niue, Samoan, and Rarotongan tamanu; Fijian damanu; and Hawaiian kamani. The region between Southwest Asia and Melanesia is the center of origin for coconuts (Cocos nucifera), where it shows greatest genetic diversity. A study in 2011 identified two highly genetically differentiated subpopulations of coconuts, one originating from Island Southeast Asia (the Pacific group) and the other from the southern margins of the Indian subcontinent (the Indo-Atlantic group). The Pacific group is the only one to display clear genetic and phenotypic indications that they were domesticated; including dwarf habit, self-pollination, and the round "niu vai" fruit morphology with larger endosperm-to-husk ratios. The distribution of the Pacific coconuts correspond to the regions settled by Austronesian voyagers indicating that its spread was largely the result of human introductions. It is most strikingly displayed in Madagascar, an island settled by Austronesian sailors at around 2,000 to 1,500 BP. The coconut populations in the island show genetic admixture between the two subpopulations indicating that Pacific coconuts were brought by the Austronesian settlers that later interbred with the local Indo-Atlantic coconuts. Most words for "coconut" in Austronesian languages are derived from proto-Malayo-Polynesian *ñiuʀ. Modern cognates include Tagalog niyog; Chamorro niyok; Malay nyiur or nyior; Tetum nuu; Drehu nu; Hawaiian, Samoan, Tongan, Fijian, and Rapa Nui niu; and Malagasy nio. The taro (Colocasia esculenta), sometimes referred to as the "true taro", is one of the most ancient cultivated crops and pre-dated the Austronesian expansion. Taro is found widely in tropical and subtropical regions of South Asia, East Asia, Southeast Asia, Papua New Guinea, and northern Australia and is highly polymorphic, making taxonomy and distinction between wild and cultivated types difficult. It is believed that they were domesticated independently multiple times, with authors giving possible locations as New Guinea, Mainland Southeast Asia, and northeastern India, based largely on the assumed native range of the wild plants. However, more recent studies have pointed out that wild taro may have a much larger native distribution than previously believed, and wild breeding types may also likely be indigenous to other parts of Island Southeast Asia. Archaeological traces of taro exploitation have been recovered from numerous sites pre-dating the Austronesian expansion, though whether these were cultivated or wild types can not be ascertained. They include the Niah Caves of Borneo, dating to <40,000 BP; Ille Cave of Palawan, dated to at least c. 11,000 BP; Kuk Swamp of New Guinea, dated to 10,200 to 9,910 cal BP; and Kilu Cave in the Solomon Islands dated to around c. 28,000 to 20,000 BP. It should be noted that in the case of Kuk Swamp, there is evidence of formalized agriculture emerging by about c. 10,000 BP, with evidence of cultivated plots, though which plant was cultivated remains unknown. Regardless, taro were definitely among the cultivated plants of Austronesians as well as preceding populations in Island Southeast Asia. However, their importance in Island Southeast Asia had largely been replaced by rice, although they are still planted at the margins of rice paddies in some communities. They remained a staple in the islands of Melanesia and Polynesia where rice wasn't introduced. They are one of the four species of aroids (taros) cultivated by Austronesians primarily as a source of starchy corms, the others being Alocasia macrorrhizos, Amorphophallus paeoniifolius, and Cyrtosperma merkusii. They are the most important and the most preferred among the four, because they were less likely to contain the irritating raphides present in the other plants..
Taro is also identified as one of the staples of Micronesia, from archaeological evidence dating back to the pre-colonial Latte Period (c. 900 - 1521 AD), indicating that it was also carried by Micronesians when they colonized the islands. Due to the unsuitability of the low-lying atoll islands of most of Micronesia, Micronesians innovated by digging pits that could then be filled up with compose suitable for taro cultivation. Taro pollen and starch residue have also been identified in earlier Lapita sites, dated to around c. 3,050 - 2,500 cal BP. There are numerous terms for taro in the Austronesian languages, both specific and generalized. The reconstructed Proto-Austronesian term for taro is *cali, with cognates in Formosan languages including Seediq sali, Thao lhari; Bunun tai; and Amis tali. It became *tales in Proto-Malayo-Polynesian, which in turn became *talos or *talo in Proto-Oceanian. Modern cognates include Hanunó'o tálus; Aborlan Tagbanwa talis; Palawan Batak täläs; Nias talõ; Minangkabau talas; Rejang and Sundanese taleus; Javanese tales; Palauan dáit; Rotinese tale; and Tetun talas. In Polynesian languages, the cognates include Motu, Marovo, Tongan, Samoan, Niue, Futunan, Tuvaluan talo; Kwaio, Lau (Malaita), and Toqabaqita alo; 'Āre'āre, Arosi, and Bauro aro; Nakanamanga na-tale; Sye tal or nal; Fijian and Nukuoro dalo; Rennellese tago; Anuta, Rarotongan, and Māori taro; and Hawaiian kalo. 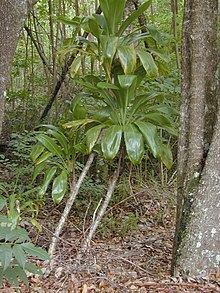 The English name for the plant is itself derived from the Polynesian names. A red variety of taro also has names derived from reconstructed Proto-Polynesian *pongi, with cognates including Niue pongi; Marquesan poki; Hawaiian poni; and Māori pongi. In Proto-Western-Malayo-Polynesian, another reconstructed term is *kaladi, with cognates including Agutaynen, Sabah Bisaya, Iban, Tae', and Wolio kaladi; Balinese and Malay keladi; and Mongondow koladi. The beach cordia (Cordia subcordata) is an important timber tree with light, finely textured, and somewhat soft wood ideal for carving. It has no taste and thus was most commonly used for carving utensils, cups, bowls, and other containers; as well as ornamental carvings and musical instruments throughout Austronesia. The wood is flammable and is commonly used in New Guinea as firewood. In some cultures, the wood may also be used to build paddles and the keels of the boats. The seeds can also be eaten, though only as famine food. Other parts can also be used for traditional medicine and for the extraction of dyes. Like Calophyllum inophyllum, beach cordia were commonly planted in marae. They have cultural and religious significance in some cultures like in Kiribati and the Karimunjawa Islands of Indonesia. In Hawaii, it was traditional to plant beach cordia around houses and use their bright orange flowers as leis. Beach cordia, like most trees favored by Austronesians, grow well in sandy, clay, and rocky soil and are a common component in coastal forests and mangrove forests. Beach cordia was once thought to be an introduced species, but it is now known to be indigenous to most of the islands and coastlines of the Indo-Pacific, propagated naturally by their buoyant seeds. Nevertheless, they were still deliberately introduced in some islands, with artificial introductions usually found growing with other common trees cultivated by Austronesians. Especially in the atolls of Micronesia. Terms for beach cordia is reconstructed to Proto-Malayo-Polynesian *kanawa, with cognates including Iban kenawa; Makasarese kanawa; Palauan kəláu; Gilbertese kanawa; Tokelau kanava; and Nukuoro ganava. Another set of cognates can be reconstructed to Proto-Oceanic *toRu, with cognates including Nehan to-tor; Petats to-tol; Fijian, Tongan, and Rarotongan tou; and Hawaiian kou. 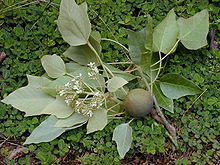 An older reconstructed term is Proto-Austronesian *qaNuNaŋ, however it is not specific to beach cordia and can refer to other members of the genus with sticky fruits, especially the glue berry (Cordia dichotoma) and the lasura (Cordia myxa). It also did not reach the Oceanic languages. Cognates include Tsou həhngə; Isneg anúnang; Hanunó'o and Cebuano anúnang; Maranao nonang; Manobo enunang; Mansaka anonang; Malay, Minangkabau, Sasak, Manggarai, and Rembong nunang; and Mongondow onunang. Ti (Cordyline fruticosa) is a palm-like plant growing up to 3 to 4 m (9.8 to 13.1 ft) tall with an attractive fan-like and spirally arranged cluster of broadly elongated leaves at the tip of the slender trunk. It has numerous color variations, ranging from plants with red leaves to green, yellow, and variegated cultivars. Its original native distribution is unknown, but it is believed to be native to the region from Bangladesh, to Mainland Southeast Asia, South China, Taiwan, Island Southeast Asia, New Guinea, and Northern Australia. It has the highest morphological diversity in New Guinea and is believed to have been extensively cultivated there. It is commonly misidentified as a "Dracaena", along with members of the genus Cordyline, due to past classification systems. It was carried throughout Oceania by Austronesians, reaching as far as Hawaii, Aotearoa (New Zealand), Rangitāhua (Kermadec Islands), and Rapa Nui at their furthest extent. 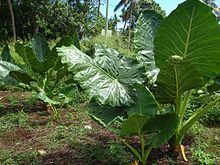 A particularly important type of ti in Polynesia is a large green-leafed cultivar grown for their enlarged edible rhizomes. Unlike the ti populations in Southeast Asia and Near Oceania, this cultivar is almost entirely sterile in the further islands of eastern Polynesia. It can only be propagated by cuttings from the stalks or the rhizomes. It is speculated that this was the result of deliberate artificial selection, probably because they produce larger and less fibrous rhizomes more suitable for use as food. Ti has many uses but it is most notable as one of the most important plants related to the indigenous animist religions of Austronesians, along with fig trees (Ficus spp.). It is very widely regarded as having mystical or spiritual powers in various Austronesian (as well as Papuan) cultures. Among a lot of ethnic groups in Austronesia it is regarded as sacred. Common features include the belief that they can hold souls and thus are useful in healing "soul loss" illnesses and in exorcising against malevolent spirits, their use in ritual attire and ornamentation, and their use as boundary markers. Red and green cultivars also commonly represented dualistic aspects of culture and religion and are used differently in rituals. Red ti plants commonly symbolize blood, war, and the ties between the living and the dead; while green ti plants commonly symbolize peace and healing. They are also widely used for traditional medicine, dye, and ornamentation throughout Austronesia and New Guinea. Their ritual uses in Island Southeast Asia have largely been obscured by the introduction of Hinduism, Buddhism, Islamic, and Christian religions, but they still persist in certain areas or are coopted for the rituals of the new religions. In ancient Hawaiʻi the plant was thought to have great spiritual power; only kahuna (shamans) and aliʻi (chiefs) were able to wear leaves around their necks during certain ritual activities. Ti was sacred to the god of fertility and agriculture Lono, and the goddess of the forest and the hula dance, Laka. Ti leaves were also used to make lei, and to outline borders between properties. It was also planted at the corners of the home to keep evil spirits away. To this day some Hawaiians plant ti near their houses to bring good luck. The leaves are also used for lava sledding. A number of leaves are lashed together and people ride down hills on them. The leaves were also used to make items of clothing including skirts worn in dance performances. The Hawaiian hula skirt is a dense skirt with an opaque layer of at least fifty green leaves and the bottom (top of the leaves) shaved flat. The Tongan dance dress, the sisi, is an apron of about 20 leaves, worn over a tupenu, and decorated with some yellow or red leaves. Giant swamp taro plantation in Butaritari, Kiribati. Yams (Dioscorea spp.) is a very large group of plants native throughout tropical and warm temperate regions of the world. Various species of yams were domesticated and cultivated independently within Island Southeast Asia and New Guinea for their starchy tubers, including the ube (Dioscorea alata), round yam (Dioscorea bulbifera), intoxicating yam (Dioscorea hispida), lesser yam (Dioscorea esculenta), Pacific yam (Dioscorea nummularia), fiveleaf yam (Dioscorea pentaphylla), and pencil yam (Dioscorea transversa). Among these, D. alata and D. esculenta were the only ones regularly cultivated and eaten, while the rest were usually considered as famine food due to their higher levels of the toxin dioscorine which requires that they be prepared correctly before consumption. D. alata and D. esculenta were the most suitable for long transport in Austronesian ships and were carried through all or most of the range of the Austronesian expansion. D. alata in particular, were introduced into the Pacific Islands and New Zealand. They were also carried by Austronesian voyagers into Madagascar and the Comoros. The ube (Dioscorea alata), also known as the greater yam or water yam, is one of the most important staple crop in Austronesian cultures. It is the main species cultivated among Dioscorea, largely because of its much larger tubers and its ease of processing. Its center of origin is unknown, but archaeological evidence suggests that it was exploited in Island Southeast Asia and New Guinea before the Austronesian expansion. Ube is believed to be a true cultigen, only known from its cultivated forms. It is a polyploid and is sterile, and thus can not cross bodies of water. This restricts its introduction into islands purely by human agency, making them a good indicator of human movement. Some authors have proposed an origin in Mainland Southeast Asia without evidence, but it shows the greatest phenotypic variability in the Philippines and New Guinea. Based on archaeological evidence of early farming plots and plant remains in the Kuk Swamp site, authors have suggested that it was first domesticated in the highlands of New Guinea from around 10,000 BP and spread into Island Southeast Asia via the Lapita culture at around c. 4,000 BP, along with D. nummularia and D. bulbifera. In turn, D. esculenta is believed to have been introduced by the Lapita culture into New Guinea. There is also evidence of an agricultural revolution during this period brought by innovations from contact with Austronesians, including the development of wet cultivation. However, much older remains identified as being probably D. alata have also been recovered from the Niah Caves of Borneo (Late Pleistocene, <40,000 BP) and the Ille Cave of Palawan (c. 11,000 BP), along with remains of the toxic ubi gadong (D. hispida) which requires processing before it can be edible. Although it doesn't prove cultivation, it does show that humans already had the knowledge to exploit starchy plants and that D. alata were native to Island Southeast Asia. Furthermore, it opens the question on whether D. alata is a true species or cultivated much older than believed. Ube remains an important crop in Southeast Asia. Particularly in the Philippines where the vividly purple variety is widely used in various traditional and modern desserts. It also remains important in Melanesia, where it is also grown for ceremonial purposes tied to the size of the tubers at harvest time. Its importance in eastern Polynesia and New Zealand, however, has waned after the introduction of other crops, most notably the sweet potato. The reconstructed Proto-Austronesian word for ube is *qubi, which became Proto-Malayo-Polynesian *qubi, and Proto-Oceanic *qupi. It has some of the most recognizable and widespread reflexes in Austronesian languages. Modern cognates include Yami uvi; Itbayaten ovi; Bontoc and Hanunó'o ʻúbi; Ilocano, Tagalog, Cebuano, Pangasinan, Aklanon, Itneg, and Itawis úbi or úbe; Kalamian Tagbanwa kubi; Maranao obi; Tiruray ʻubi; Manobo uvi; Kenyah, Malay, Iban, Balinese, Sasak, Mongondow, and Toba Batak ubi; Kelabit ubih; Melanau ubey; Ngaju Dayak owi; Malagasy óvy; Tsat phai; Jarai hebey; Moken koboi; Sundanese huwi; Tontemboan, Bimanese, and Manggarai uwi; Ngadha uvi; Rotinese ufi; Erai uhi; Selaru uh or uhi-re; Watubela kuwi; Buruese ubi-t; Koiwai uf; Buli up; and Waropen uwi. Among Oceanic languages, cognates include Nauna kuh; Penchal kup; Leipon uh; Tolai up; Lakalai la-huvi; Gapapaiwa and Kilivila kuvi; Papapana na-uvi; Simbo, Bugotu, and Nggela, and Fijian uvi; Kwaio, Niue, and Samoan ufi; Sa'a, Arosi, Tuamotuan, Hawaiian and Rapa Nui uhi; Marquesan puauhi; Haununu a-uhi; Avava ''o-ovi; Rennellese ʻuhi; Tongan ʻufi; Anuta upi; Rarotongan uʻi; and Māori uwhi or uhi. In some ethnic groups, the word has been generalized or shifted to mean other types of yams, as well as the sweet potato and cassava. Other words for ube are also derived from the ancestral names of other species of yam. The air yam (Dioscorea bulbifera), also known as the bitter yam, is one of the lesser cultivated species of yam. It is usually only eaten as famine food in Island Southeast Asia, Melanesia, and Polynesia, because of the toxicity of some wild or feral plants when not cooked correctly. However it is one of only three yams that were carried by Austronesians into Remote Oceania, the others being D. alata and D. nummularia. The part of the plant harvested are the aerial tubers, as it does not usually produce large underground tubers. It can be reconstructed to Proto-Oceanic as *pwatika or *pʷatik, with cognates including Lou puet; Lamusong patik; Boanaki posika; and Kwara'ae fasia. However, in Lamusong its meaning has shifted to the lesser yam, while in Boanaki, the meaning has shifted to a more generalized term for yams. It can also be reconstructed to the more generalized Proto-Oceanic *balai, meaning "wild yam", which became Proto-Micronesian *palai, with cognates including Rotuman parai; Tongan, Niue, and Samoan palai; and Rennellese pagai. The lesser yam (Dioscorea esculenta) is the second most important yam crop among Austronesians. Like D. alata, it requires minimal processing, unlike the other more bitter yam species. However, it has smaller tubers than D. alata and is usually spiny. Like D. alata it was introduced to Madagascar and the Comoros by Austronesians, where it spread to the East African coast. They are also a dominant crop in Near Oceania, However, it did not reach to the furthest islands in Polynesia, being absent in Hawaii and New Zealand. Starch grains identified to be from the lesser yam have been recovered from archaeological sites of the Lapita culture in Viti Levu, Fiji, dated to around 3,050 to 2,500 cal BP. Traces of D. esculenta (along with D. alata, D. bulbifera, D. nummularia and D. pentaphylla) yams have also been identified from the Mé Auré Cave site in Moindou, New Caledonia, dated to around 2,700 to 1,800 BP. Remains of D. esculenta have also been recovered from archaeological sites in Guam, dated to around 1031 CE. D. esculenta is believed to have been introduced by the Lapita culture into New Guinea at around 4,000 BP, along with agricultural innovations like wet cultivation as well as swidden farming. In archaeological sites in New Guinea, it is associated with the appearance of high-density populations in the coastal areas. Terms for lesser yam in Austronesian languages are mostly affixed or two-word forms derived from the *qubi root for D. alata, like Samoan ufi lei, Javanese ubi gemblii, Sundanese ubi aung, and Malay ubi torak. A term for lesser yam can be reconstructed in Proto-Philippine as *tugiq, but its cognates are limited to the island of Luzon, including Ivatan togi; Ilocano and Kankana-ey tugí; Bontoc and Ifugao tugi; and Tagalog tugiʻ. No Proto-Oceanic term can be reconstructed for the lesser yam because it is absent in Remote Oceania. However, it can be reconstructed in Proto-Western-Oceanic as *kamisa, *qamisa, or *mamisa. Intoxicating yam (Dioscorea hispida), is native to tropical Asia and New Guinea. It is only cultivated minimally in parts of Java. Elsewhere it is harvested from the wild. Like D. bulbifera it has toxic tubers that need to be prepared correctly before they can be eaten, and thus were only suitable for famine food. However, it is one of the Dioscorea species identified from the Niah Caves archaeological site dating to <40,000 BP. Its names can be reconstructed to Proto-Western-Malayo-Polynesian *gaduŋ. Its modern cognates in most Western Malayo-Polynesian languages is gadung or gadong (also ubi gadung or ubi gadong). 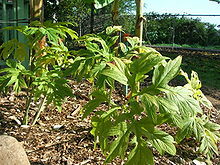 The names are also applied to the similarly toxic introduced cassava. Noni (Morinda citrifolia) is native to Southeast Asia extending to New Guinea and northern Australia. It grows readily in beach and rocky environments. It has been introduced widely into the Pacific. All parts of the plant were used by Austronesians for traditional medicine and timber, but its most common traditional use is for the extraction of red or yellow dyes. The odor of the plant and the fruit was also traditionally believed to repel evil spirits. The fruit is also edible, but is usually only eaten as famine food. There are several terms for noni that can be reconstructed. The most widespread is Proto-Central-Eastern Malayo-Polynesian *ñəñu. Cognates include Kapampangan lino; Tagalog and Bikol níno; Cebuano ninú; Gedaged nanom or nonom; Takia nom; Bimanese nonu; Tetun nenu-k; Leti and Asilulu nenu; Leti (Moa) nienu; Wetan neni. It became Proto-Oceanic *ñoñu, with cognates including Nali non; Leipon and Wogeo ñoñ; Bipi ñoy; Gitua and Rarotongan nono; Gilbertese non; Motu, Tongan, Niue, Futunan, Samoan, Tuvaluan, Kapingamarangi, Nukuoro, and Anuta nonu; and Hawaiian noni (from which the English name is derived from). In some languages the meaning has shifted to mean "small tree" or "shrub" or to the closely related Morinda umbellata and Morinda bracteata. In Western Malayo-Polynesian, another term that can be reconstructed is Proto-Western Malayo-Polynesian *baŋkudu, which may have referred to a different species of Morinda originally. Its cognates including Tagalog and Cebuano bangkúro; Agutaynen bangkoro; Tausug, Toba Batak, and Balinese bangkudu; Sundanese cangkudu; Javanese wangkudu; Sasak bengkudu; and Mongondow bongkudu. There are also smaller cognate sets, like Proto-Philippine *apatut for the tree and Proto-Oceanic *gurat and *kurat for the red dye produced from the tree. The earliest domestication of bananas (Musa spp.) were initially from naturally occurring parthenocarpic (seedless) individuals of Musa acuminata banksii in New Guinea, before the arrival of Austronesian-speakers. Numerous phytoliths of bananas have been recovered from the Kuk Swamp archaeological site and dated to around 10,000 to 6,500 BP. From New Guinea, cultivated bananas spread westward into Island Southeast Asia through proximity (not migrations). They hybridized with other (possibly independently domesticated) subspecies of Musa acuminata as well as Musa balbisiana in the Philippines, northern New Guinea, and possibly Halmahera. These hybridization events produced the triploid cultivars of bananas commonly grown today. From Island Southeast Asia, they became part of the staple crops of Austronesian peoples and were spread during their voyages into East Africa and Oceania. These ancient introductions resulted in the banana subgroup now known as the "true" plantains, which include the East African Highland bananas and the Pacific plantains (the Iholena and Maoli-Popo'ulu subgroups). East African Highland bananas originated from banana populations introduced to Madagascar probably from the region between Java, Borneo, and New Guinea; while Pacific plantains were introduced to the Pacific Islands from either eastern New Guinea or the Bismarck Archipelago. A second wave of introductions later spread bananas to other parts of tropical Asia, particularly Indochina and the Indian Subcontinent. Abacá (Musa textilis), also known as Manila Hemp, is grown traditionally for its fiber in the Philippines. It was once one of the world's premier fibers, valued for its use in soft, lustrous, and silky fabrics. It was a major luxury export of the Philippines during the Colonial Era, and was introduced to Hawaii and Central America by Europeans. It has since been replaced by synthetic fibers like rayon and nylon. Fe'i bananas (Musa × troglodytarum), also spelled Fehi or Féi, are banana cultivars unique to Melanesia, the Maluku Islands, and Polynesia. Unlike other domesticated banana cultivars which are derived from Musa acuminata and Musa balbisiana, fe'i bananas are believed to be hybrids derived from entirely different species. Proposed progenitors of fe'i bananas include Musa jackeyi, Musa lolodensis, Musa maclayi, and Musa peekelii, all of which are native to New Guinea and surrounding islands. Like other bananas, they were spread eastwards to Polynesia for use as food. However, they are absent in Island Southeast Asia, reaching only as far as the Maluku Islands. Rice (Oryza sativa) is one of the most ancient Austronesian staples, and is likely to have been originally domesticated by their ancestors long before the Austronesian expansion. It remains the main crop plant cultivated in Island Southeast Asia. 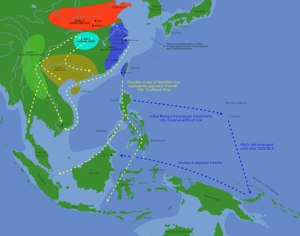 The spread of japonica rice cultivation to Southeast Asia started with the migrations of the Austronesian Dapenkeng culture into Taiwan between 5,500 and 4,000 BP. The Nanguanli site in Taiwan, dated to ca. 4,800 BP, has yielded numerous carbonized remains of both rice and millet in waterlogged conditions, indicating intensive wetland rice cultivation and dryland millet cultivation. From about 4,000 to 2,500 BP, the Austronesian expansion began, with settlers from Taiwan moving south to colonize Luzon in the Philippines, bringing rice cultivation technologies with them. From Luzon, Austronesians rapidly colonized the rest of Island Southeast Asia, moving westwards to Borneo, the Malay Peninsula and Sumatra; and southwards to Sulawesi and Java. By 2,500 BP, there is evidence of intensive wetland rice agriculture already established in Java and Bali, especially near very fertile volcanic islands. However, rice (as well as dogs and pigs) did not survive the first Austronesian voyages into Micronesia due to the sheer distance of ocean they were crossing. These voyagers became the ancestors of the Lapita culture. By the time they migrated southwards to the Bismarck Archipelago, they had already lost the technology of rice farming, as well as pigs and dogs. However, knowledge of rice cultivation is still evident in the way they adapted the wetland agriculture techniques to taro cultivation. The Lapita culture in Bismarck reestablished trade connections with other Austronesian branches in Island Southeast Asia. The Lapita culture also came into contact with the non-Austronesian (Papuan) early agriculturists of New Guinea and introduced wetland farming techniques to them. In turn, they assimilated their range of indigenous cultivated fruits and tubers, as well as reacquiring domesticated dogs and pigs, before spreading further eastward to Island Melanesia and Polynesia. Rice, along with other Southeast Asian food plants, were also later introduced to Madagascar, the Comoros, and the coast of East Africa by around the 1st millennium CE by Austronesian sailors from the Greater Sunda Islands. It should also be noted that much later Austronesian voyages from Island Southeast Asia succeeded in bringing rice to Guam during the Latte Period (1,100 to 300 BP). Guam is the only island in Oceania where rice was grown in pre-colonial times. Pandanus (Pandanus spp.) are very important cultivated plants in the Pacific, second only in importance and pervasiveness to coconuts. Every part of the plant is utilized, including for food, building materials, traditional medicine, and fiber and weaving materials in various cultures in Austronesia. The plants (particularly the fragrant flowers) also had spiritual significance among the native animist Austronesian religions. Pandanus were also profoundly crucial in enabling the Austronesian expansion. Their leaves were traditionally woven into mats used in the sails for Austronesian outrigger ships. Sails allowed Austronesians to embark on long-distance voyaging. In some cases, however, they were one-way voyages. The failure of pandanus to establish populations in Rapa Nui and Aotearoa is believed to have isolated their settlements from the rest of Polynesia. The word for pandanus in Austronesian languages is derived from Proto-Austronesian *paŋudaN, which became Proto-Oceanic *padran and Proto-Polynesian *fara, the latter two usually referring specifically to Pandanus tectorius. Cognates in modern Austronesian languages include Kanakanavu pangətanə; Thao and Bunun panadan; Tagalog pandan; Chamorro pahong; Ratahan pondang; Malay pandan; Manggarai pandang; Malagasy fandrana; Lau fada-da; Fijian vadra; Samoan fala; Tongan fā; Tahitian fara; Hawaiian hala; and Māori whara or hara. Note that among the Formosan languages of Indigenous Taiwanese, the meaning of the words have largely shifted to mean "pineapple", a physically similar non-native European-introduced plant. In Māori, as well, the meaning has shifted to Astelia spp. and Phormium tenax (harakeke), similar plants used for weaving, since pandanus did not survive the voyage into Aotearoa. Pandanus grow well in island habitats, being very salt-tolerant and easy to propagate, making them ideal plants for early Austronesian sailors. Like coconuts, they grow predominantly along strandlines, mangrove forests, and other coastal ecosystems. They can also be found in the understory of forests in larger islands. Others may also be found in highland groves, likely planted by humans. Both pandanus and coconuts are adapted to withstand the strong winds of the frequent typhoons of the Indo-Pacific. The greatest center of diversity of Pandanus is the western Pacific and Island Southeast Asia. The genus has around 600 species, but the most important and the most widespread group of species in Austronesian cultures and is the Pandanus tectorius complex. Pandanus tectorius in Oceania show evidence of long cultivations, with hundreds of different selectively bred cultivars which are primarily propagated through cuttings. These varieties often have different names in local languages and have different physical characteristics. The varieties are predominantly distinguished by the color and edibility of their fruit, but they may also be differentiated based on other criteria like the color and shape of their leaves used for weaving. Very old fossils of Pandanus tectorius have been recovered from Hawaii, dated to more than 1.2 million years old. This indicates that the plants once colonized Hawaii (and likely the rest of the Pacific islands) naturally through their buoyant fruits. However, useful domesticated varieties were carried by Austronesians from island to island. Especially since wild pandanus have calcium oxalate crystals (raphides) in their fruit tissue. They cause itchiness and irritation when eaten raw and thus need to be cooked. Domesticated varieties which have less raphides (which are also usually less fibrous and more nutritious), were therefore valued . It is thus considered both native and introduced. 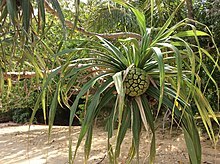 There are also fossil evidence of pandanus fruits being harvested for food in New Guinea from archaeological sites dated to around 34,000 to 36,000 BP. Other important species of pandanus utilized by Austronesians include Pandanus amaryllifolius, Pandanus odorifer, Pandanus furcatus, Pandanus julianettii, Pandanus simplex, Pandanus utilis, Pandanus dubius, and Pandanus whitmeeanus, among many others. Pandanus odorifer is widespread in the region from western Micronesia, to Island Southeast Asia and South Asia. It is possibly a subspecies of Pandanus tectorius and they hybridize readily. Pandanus amaryllifolius, the pandan, is another important species widely used as a spice in the cuisines of Southeast Asia for their vanilla-like fragrant leaves. Peppers (Piper) ancestrally cultivated by Austronesians include the betel (Piper betle), cubeb pepper (Piper cubeba), kava (Piper methysticum), and the Javanese long pepper (Piper retrofractum). Many others were also harvested from the wild for medicinal or religious purposes, including Piper caducibracteum, Piper excelsum, Piper ornatum, and Piper sarmentosum. Black pepper (Piper nigrum) and long pepper (Piper longum) were also extensively cultivated in Island Southeast Asia after early contact by Austronesian traders with South India and Sri Lanka. The betel (Piper betle) is one of the two plants that comprise the main ingredients of betel chewing, the other being the areca nut (Areca catechu). It is one of the most ubiquitous practices of the Austronesians. It is consumed by taking a leaf of betel, wrapping it around an areca nut and some lime (obtained from grinding seashells), and then chewing it for some time. It is a stimulant, inducing slight dizzines followed by euphoria and alertness. It is also highly addictive, damages the teeth and gums, and stains the teeth red. Based on archaeological, linguistic, and botanical evidence, betel chewing is most strongly associated with Austronesian cultures, despite its widespread adoption by neighboring cultures in prehistoric and historic times. The original range of betel is unknown, but Areca catechu is known to be originally native to the Philippines, where it has the greatest morphological diversity as well as the most number of closely related endemic species. It is unknown when the two were combined, as areca nut alone can be chewed for its narcotic properties. In eastern Indonesia, however, leaves from the wild Piper caducibracteum (known as sirih hutan) are also harvested and used in place of betel leaves. The oldest unequivocal evidence of betel chewing is from the Philippines. Specifically that of several individuals found in a burial pit in the Duyong Cave site of Palawan island dated to around 4,630±250 BP . The dentition of the skeletons are stained, typical of betel chewers. The grave also includes Anadara shells used as containers of lime, one of which still contained lime. Burial sites in Bohol dated to the first millennium CE also show the distinctive reddish stains characteristic of betel chewing. Based on linguistic evidence of how the reconstructed Proto-Austronesian term *buaq originally meaning "fruit" came to refer to "areca nut" in Proto-Malayo-Polynesian, it is believed that betel chewing originally developed somewhere within the Philippines shortly after the beginning of the Austronesian expansion (~5,000 BP). From the Philippines, it spread back to Taiwan, as well as onwards to the rest of Austronesia. The practice also diffused to the cultures the Austronesians had historical contact with. It reached South Asia by 3,500 BP, through early contact of Austronesian traders from Sumatra, Java, and the Malay Peninsula with the Dravidian-speakers of Sri Lanka and southern India. This also coincides with the introduction of Southeast Asian plants like Santalum album and Cocos nucifera, as well as the adoption of the Austronesian outrigger ship and crab-claw sail technologies by Dravidian-speakers. It Mainland Southeast Asia by 3,000 to 2,500 BP through trade with Borneo, as well as the settlement of the Champa polities in southern Vietnam. From there, it was spread northwards into China. Lastly, it reached Northern India by 500 BP through trade in the Bay of Bengal. From there it was spread westwards into Persia and the Mediterranean. There are numerous cognate sets reconstructible in Austronesian languages relating to various aspects of betel chewing. Ranging from chewing something without swallowing to equipment used to climb areca nut palms to the betel spittle. One cognate set that can be reconstructed for betel pepper is Proto-Western Malayo-Polynesian *Rawed which became Proto-Philippine *gawed, with cognates including Yami gaod, Itbayaten gawed; Ilocano gawéd; Isneg khawád; Casiguran Dumagat gawə́d; and Ibaloy kawed; Balangaw lawɨ'd; Kalagan lawód; and Kenyah auat or awet. Two other cognate sets reached into Oceania. The first is Proto-Malayo-Polynesian *pu-pulu, which became Proto-Oceanian *[pu-]pulu. Cognates include Mussau ulo; Loniu pun; Bipi pun or puepun; Lukep ul; Takia ful; Gedaged fu; Manam ulusalaga; and Bugotu vu-vulu. The other is Proto-Meso-Melanesian *siqa(r,R)(a), with cognates including Kara and Lihir sie; Tabar sia; Patpatar sier; Tolai ier; Nehan hiara; Petats sil; Teop hia(kuru); Tinputz (ta)sian; Banoni siɣana; and Marovo hirata. The cubeb pepper (Piper cubeba) are native to Island Southeast Asia. Like Piper retrofractum, however, it was only cultivated extensively in the Greater Sunda Islands for the spice trade. The Javanese protected the monopoly of the trade by sterilizing the seeds before trading them. It has a pungent smell, often compared to allspice, quite unlike that of the other culinary peppers. It also has a slightly bitter taste. It is notable as having reached as far as Greece during ancient times via the Silk Road. It was a valuable rare spice in Medieval Europe and the Middle East, reputed to have medicinal and magical properties. Medieval Arab physicians commonly used it for a range of treatments, ranging from treating infertility to poison antidotes. It is mentioned in The Book of One Thousand and One Nights as well as in the travelogues of Marco Polo. Its trade waned during the Colonial Era when the Portuguese Empire banned its importation to promote the black pepper produced by its own colonies. Kawakawa (Piper excelsum) is a small tree or shrub endemic to Aotearoa and nearby Norfolk Island, Lord Howe Island, and the Rangitāhua Islands. It was exploited by Austronesian settlers based on previous knowledge of the kava, as the latter could not survive in the colder climates of Aotearoa. The Māori name for the plant, kawakawa, is derived from the same etymon as kava, but reduplicated. It is a sacred tree among the Māori people. It is seen as a symbol of death, corresponding to the rangiora (Brachyglottis repanda) which is the symbol of life. Boughs of kawakawa are often used in purification rituals. However, kawakawa's resemblance to true kava is only superficial. Kawakawa roots do not have psychoactive properties. Instead, kawakawa's primary use is for traditional medicine. Kava (Piper methysticum) is a small tree or shrub believed to have been domesticated in either New Guinea or Vanuatu by Papuans. It is believed to be a domesticated variety of Piper subbullatum which is native to New Guinea and the Philippines. It was spread by Austronesians after contact into the rest of Polynesia. It is endemic to Oceania and is not found in other Austronesian groups. Kava has great cultural and religious significance among Polynesians. The roots are pounded and mixed with water then strained through fibers. The resulting cloudy gray liquid is bitter with mildly psychoactive and narcotic properties, with a common effect being numbness around the lips and mouth. However, it is not hallucinogenic nor addictive. The potency of the root depends on the age of the plants. The leaves and roots can also be chewed directly resulting in a numbing effect and relaxation. It is traditionally consumed both in everyday social interactions and in religious rituals. Kava reached Hawaii, but it is absent in Aotearoa where it can not grow. Consumption of kava is also believed to be the reason why betel chewing, ubiquitous elsewhere, was lost for Austronesians in Oceania. 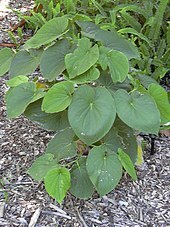 According to Lynch (2002), the reconstructed Proto-Polynesian term for the plant, *kava, was derived from the Proto-Oceanic term *kawaRi in the sense of a "bitter root" or "potent root [used as fish poison]". It originally referred to Zingiber zerumbet, which was used to make a similar mildly psychoactive bitter drink in Austronesian rituals. Cognates for *kava include Pohnpeian sa-kau; Tongan, Niue, Rapa Nui, Tuamotuan, and Rarotongan kava; Samoan and Marquesan ʻava; and Hawaiian ʻawa. In some languages, most notably Māori kawa, the cognates have come to mean "bitter", "sour", or "acrid" to the taste. In the Cook Islands, the reduplicated forms of kawakawa or kavakava are also applied to the unrelated members of the genus Pittosporum. And in other languages like in Futunan, compound terms like kavakava atua refer to other species belonging to the genus Piper. The reduplication of the base form is indicative of falsehood or likeness, in the sense of "false kava". The Javanese long pepper (Piper retrofractum) is native to Island Southeast Asia from the Philippines to Sumatra. Its northern range also extends to southern China, mainland Southeast Asia, Taiwan, and the Ryukyu Islands. However it was historically only cultivated in any great extent in the islands of Java and Bali, and surrounding islands, for the spice trade. Elsewhere it is mostly grown informally in the backyards of houses. It is very similar to the Indian long pepper (Piper longum) and is used in the same way in Southeast Asian cuisine. There are two centers of domestication for sugarcane (Saccharum spp. ): one for Saccharum officinarum by Papuans in New Guinea and another for Saccharum sinense by Austronesians in Taiwan and southern China. Papuans and Austronesians originally primarily used sugarcane as food for domesticated pigs. The spread of both S. officinarum and S. sinense is closely linked to the migrations of the Austronesian peoples. The second domestication center is mainland southern China and Taiwan where S. sinense (though other authors identify it as S. spontaneum) was one of the original major crops of the Austronesian peoples from at least 5,500 BP. Introduction of the sweeter S. officinarum may have gradually replaced it throughout its cultivated range in Island Southeast Asia. From Island Southeast Asia, S. officinarum was spread eastward into Polynesia and Micronesia by Austronesian voyagers as a canoe plant by around 3,500 BP. It was also spread westward and northward by around 3,000 BP to China and India by Austronesian traders, where it further hybridized with Saccharum sinense and Saccharum barberi. From there it spread further into western Eurasia and the Mediterranean. The reconstructed word for "sugarcane" in Proto-Austronesian is **CebuS or *təbuS, which became Proto-Malayo-Polynesian *tebuh, Proto-Oceanic *topu, and Proto-Polynesian *to. Modern cognates include Hoanya and Bunun sibus; Rukai cobosə or tibóso; Tagalog tubó; Chamorro tupu; Murik Kayan tebu; Malay tebu; Ansus tobu; Malmariv tov; Fijian dovu; Mele-Fila and Takuu toro; Samoan tolo; Tagula ro; Pohnpeian cheu; Tahitian to; Pukapukan, Rarotongan, and Tongan tō; Hawaiian kō; and Rapa Nui to or ta. In Malagasy, however, the word for "sugarcane" is fary, which is instead derived from Proto-Austronesian *pajey, meaning "rice". Trees in the genus Syzygium contain some of the most important fruit trees among Austronesian peoples. Species cultivated or harvested for their edible fruit include the Java plum (Syzygium cumini), jambos (Syzygium jambos), lubeg (Syzygium lineatum), swamp maire (Syzygium maire), mountain apple (Syzygium malaccense), lipote (Syzygium polycephaloides), and the Java apple (Syzygium samarangense), among others. Two species are also important sources of spice: the clove tree (Syzygium aromaticum) and Indonesian bay leaf (Syzygium polyanthum). 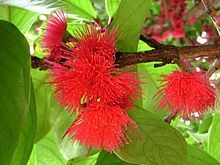 The mountain apple (Syzygium malaccense) along with the closely related species like the water apple (Syzygium aqueum) and the Java apple (Syzygium samarangense), are native throughout Island Southeast Asia and were cultivated since prehistory. They were all carried by Austronesians into the Pacific and planted deliberately. They were valued primarily for their abundant edible fruits. It is also used for timber (usually for building houses) and parts of the trees are used in traditional medicine. The attractive flowers are also worn as personal hair adornments and in making leis. They were primarily propagated through cuttings by Melanesians and Polynesians. The groves of mountain apples found in the Pacific are often remnants of ancient plantings, as the seeds of the fruits are too large to be dispersed by the native birds. Related species endemic to the Pacific Islands were also utilized similarly, like Syzygium corynocarpum and Syzygium neurocalyx. 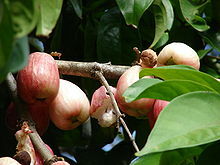 There numerous names for mountain apples in Austronesian languages. In the Philippines, the terms can be reconstructed to Proto-Philippine *makúpa, with cognates including Ilocano, Aklanon, and Cebuano makúpa; and Tagalog and Bikol makópa. In Oceania, there are several cognate sets reconstructible for mountain apples and related species. Four of which are *pokaq, *marisapa, *sakau and *cay, with limited reflexes and may have originally referred to other species. The most widespread cognate set, however, can be reconstructed to Proto-Oceanic *kapika. Its cognates include Mussau kaviu; Seimat ahi, Lou keik; Maenge and Nakanai gaiva; Tami kapig; Yabem àing; Motu gavika; Bola kavika; Babatana kapika; Gela gaviga; Kwara'ae ʻafiʻo; Paamese ahie; Wayan, Niue, East Uvean, and Bauan kavika; Tongan fekika; Anutan kapika; Marquesan kehika; Mangarevan keʻika; Tahitian ʻahiʻa; Hawaiian ʻoohiaʻai; Rarotongan kaʻika; and Māori kahika. In Māori, the names have shifted to Metrosideros fulgens, which have similar-looking flowers, as Malay apples did not survive into Aotearoa. Polynesian arrowroot (Tacca leontopetaloides) is another ancient Austronesian root crop closely related to yams. It is originally native to Island Southeast Asia. It was introduced throughout the entire range of the Austronesian expansion, including Micronesia, Polynesia, and Madagascar. 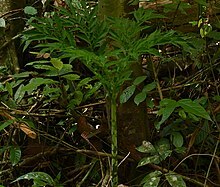 Polynesian arrowroot have been identified as among the cultivated crops in Lapita sites in Palau, dating back to 3,000 to 2,000 BP. It was also introduced to Sri Lanka, southern India, and possibly also Australia through trade and contact. Polynesian arrowroot, was a minor staple among Austronesians. The roots are bitter if not prepared properly, thus it was only cultivated as a secondary crop to staples like Dioscorea alata and Colocasia esculenta. Its importance increased for settlers in the Pacific Islands, where food plants were scarcer, and it was introduced to virtually all the inhabited islands. They were valued for their ability to grow in low islands and atolls, and were often the staple crops in islands with these conditions. In larger islands, they were usually allowed to grow feral and were useful only as famine food. Several cultivars have been developed in Polynesia due to the thousands of years of artificial selection. The starch extracted from the root with traditional methods can last for a very long time, and thus can be stored or traded. The starch can be cooked in leaves to make starchy puddings. Due to the introduction of modern crops, it is rarely cultivated today. The names for Polynesian arrowroot in Austronesian languages reflect its secondary importance as a crop. They are often reassignments from names of other starch crops, rather than specifically being for Polynesian arrowroot. Usually, the names of Polynesian arrowroot are transferred from the names of the sago palms (Metroxylon sagu), giant swamp taros (Cyrtosperma merkusii), and fermented breadfruit (Artocarpus altilis). Derivations from Proto-Malayo-Polynesian *sagu ("sago palm"), include Chamorro and Toba Batak sagu. Derivations from Proto-Polynesian *mā ("fermented breadfruit"), inclded Tongan māhoaʻa; Tokelauan mahoā; Anutan maoa; East Futunan māsoʻā; Samoan māsoā; and Tuvaluan māsoa. Derivations from Proto-Polynesian *bulaka (giant swamp taro) include Patpatar and Tolai pulaka. Derivations from Proto-Austronesian *biRaq (giant taro) include Äiwoo (to)piya. And finally, derivations from Proto-Oceanic Rabia (sago) include Bauan yabia; and Pileni, Rarotongan, and Hawaiian pia. Sea hibiscus (Talipariti tiliaceum) is a common tree in beaches in the tropical Indo-Pacific. It is widely used by Austronesian peoples for timber and fiber. It has several subspecies, two of which are endemic to the Philippines and Sulawesi, with the rest widespread throughout its range or native to large regions of Southeast Asia and the Pacific. The seeds remain viable for months after floating in the sea. However, no remains of beach hibiscus have been recovered from Polynesia prior to the Austronesian arrival, making it clear that they were introduced by Austronesian voyagers. The wood is soft and not very durable, so it is mostly only used for products like carvings, spears, bowls, and bracelets. However, it is also resistant to saltwater and thus can be used to make small canoes and outriggers. The wood is also preferred for fire making by friction. The fiber extracted from the bark is widely used to make cordage and for caulking. The bark is also used in the production of tempeh in Southeast Asia, and kava drinks in Polynesia. The attractive flowers are commonly made into leis in Hawaii. The terms for beach hibiscus can be reconstructed to Proto-Malayo-Polynesian *baRu, which became Proto-Oceanic *paRu and Proto-Micronesian *kili-fau. Modern cognates include Itbayaten vayu; Ilocano bagó; Kankana-ey bágo; Chamorro pagu; Tagalog balibago; Cebuano malabago or maribago; Maranao bago; Ngaju Dayak baro; Malagasy baro or varo; Malay baru; Javanese, Rembong, and Kambera waru; Sangir and Soboyo bahu; Makasar baru; Erai hau; Leti paru; Paulohi haru; Buruese fahu; Gitua paru; Mailu waru; Mota var or varu; Sye nau or vau; Anejom n-hau; Fijian vau; Tongan and Samoan fau; Rotuman, Rennellese, and Hawaiian hau; and Māori whau. In addition, there are numerous terms relating to the use of sea hibiscus for cordage and fiber in various Austronesian languages which can be traced back to Proto-Malayo-Polynesian or Proto-Austronesian, like *Calis, "rope". The Pacific rosewood (Thespesia populnea) is closely related to beach hibiscus. They are similar in appearance and grow in the same habitats, thus they are commonly confused with each other. It is also used similarly among Austronesian cultures, being one of the main sources of bast fibers for the production of cordage and wood for Austronesian outrigger ships and carving.. Pacific rosewood is native to the Old World tropics. Like beach hibiscus, the seeds remain viable for months after floating in the sea but no remains of T. populnea have been recovered from Polynesia prior to the Austronesian expansion. Thus it is regarded as deliberate introductions by Austronesian settlers. The trees were regarded as sacred in Polynesian culture, and were commonly planted in marae sites along with trees like Ficus, Fagraea berteroana, Casuarina equisetifolia and Calophyllum inophyllum. The terms for Pacific rosewood can be reconstructed to Proto-Malayo-Polynesian *balu, with cognates including Itbayaten valu; Malagasy válo; Simeulue falu; Ngela valu; Arosi haru; and Lonwolwol bal. Another term which extends to Oceanic is Proto-Malayo-Polynesian *banaRu with cognates including Hanunó'o banagu; Tolai banar; Patpatar banaro; Mota vanau; and Pohnpeian pana. In Eastern Polynesia, most modern names can be reconstructed back to Proto-Eastern Oceanic *milo, with cognates including Tongan, Niue, Samoan, and Hawaiian milo; Rapa Nui, Tahitan, Tuamotuan, and Māori miro; and Marquesan miʻo. In some islands, the names have shifted to refer to trees that are used similarly, like Prumnopitys ferruginea in Aotearoa and Sophora toromiro in Rapa Nui. Gingers (family Zingiberaceae) were cultivated extensively by Austronesians for food, medicine, weaving materials, and for religious purposes. The most commonly cultivated species include the lengkuas (Alpinia galanga), fingerroot (Boesenbergia rotunda), turmeric (Curcuma longa), torch ginger (Etlingera elatior), and ginger (Zingiber officinale). Other species were also exploited at a smaller scale or harvested from the wild, including dwarf cardamom (Alpinia nutans), panasa cardamom (Amomum acre), white turmeric (Curcuma zedoaria), jiddo (Hornstedtia scottiana), white ginger lily (Hedychium coronarium), and bitter ginger (Zingiber zerumbet). The lengkuas (Alpinia galanga) is native to Southeast Asia. Its original center of cultivation during the spice trade was Java, and today it is still cultivated extensively in Island Southeast Asia, most notably in the Greater Sunda Islands and the Philippines. It is valued for its use in food and for traditional medicine and is regarded as being superior to ginger. It has a pungent smell reminiscent of black pepper. The red and white cultivars are often used differently, with the red cultivars being primarily medicinal, and the white cultivars being primarily a spice. Lengkuas is also the source of the leaves used to make nanel among the Kavalan people of Taiwan, a rolled leaf instrument used as a traditional children's toy common among Austronesian cultures. Lengkuas can be reconstructed to Proto-Western Malayo-Polynesian *laŋkuas, with cognates including Ilokano langkuás; Tagalog, Bikol, Kapampangan,Visayan, and Manobo langkáuas or langkáwas; Aklanon eangkawás; Kadazan Dusun hongkuas; Ida'an lengkuas; Ngaju Dayak langkuas; Iban engkuas; and Malay lengkuas (from which the English name is derived from). Some of the names have become generalized and are also applied to other species of Alpinia as well as for Curcuma zedoaria. There is strong evidence that turmeric (Curcuma longa) as well as the related white turmeric (Curcuma zedoaria) were independently domesticated by Austronesians. Turmeric has a very widespread distribution and names that pre-date contact with India, being found among all Austronesian regions with the exception of Taiwan. However, it was seemingly originally domesticated for the production of dyes, eventually contributing to the words for "yellow" and "red" in various Austronesian languages. The plant is important in the Philippines and Indonesia as a traditional dye for clothing and food coloring. It was particularly valued for coloring food offerings to spirits as well as body painting in religious rituals or social ceremonies. It is also used as a spice, as medicine and as food. Similar uses are also found in the other islands settled by Austronesians, including Madagascar and the Comoros in East Africa. In Micronesia, it was a valuable trade item acquired from Yap. In Polynesia and Melanesia, they are primarily used as body paint in rituals or as a cosmetic. The latter regions have been isolated for centuries from the rest of Island Southeast Asia prior to European contact. There are two main cognate sets for C. longa and C. zedoaria (both of which produce yellow dye) in Austronesian languages. The first is reconstructed as Proto-Malayo-Polynesian *kunij which originally referred to turmeric. Its cognates include Ilocano, Kankana-ey, and Isneg kúnig; Bontoc kúnəg; Ifugao ūnig; Casiguran Dumagat kuneg; Iban and Malay kunyit; Toba Batak hunik; Javanese kunir; Sangir and Tae' kuniʻ; Uma kuni; Rembong kunis; Ngadha wuné; and Manggarai wunis. In Malagasy and Betsimisaraka, the cognates hónitra and húnitra have shifted meaning to a different plant used to make red dye. Other cognates like Ilocano kimmúnig; Uma mo-kuni, and Tae' pakuniran all mean "yellow" or "to dye something yellow". The other cognate set is derived from reconstructed Proto-Western-Malayo-Polynesian *temu, and originally meant C. zedoaria which was used primarily as a spice. It also sometimes shifted to ginger and other ginger-like plants used for cooking (rather than dye production). Its cognates include Kapampangan and Balinese tamu; Tagalog támo; Visayan tamangyan; Bukidnon tamohilang; Bikol tamahilan or tamaylan; Malay, Javanese, and Sasak temu; Makasarese tammu; and Malagasy tamutamu. In other Austronesian languages in East Africa, however, the other cognates mean "yellow", including Comorian Shibushi and Antemoro tamutamu; and Antambahoaka and Antankarana manamutamu. In Proto-Oceanic, there are two main cognate sets derived from reconstructed *aŋo and *deŋ(w)a, both are unrelated to the Proto-Malayo-Polynesian etymons. The latter probably originally applied to the dye produced from turmeric, while the former referred originally to the plant itself. Cognates include Fijian cango; and Tongan and Rennellese ango. Cognates that mean "yellow" also exist in numerous other languages in Near Oceania. Ginger (Zingiber officinale) is native to Island Southeast Asia and was probably originally domesticated by Austronesians. It is an ancient and ubiquitous crop among Austronesians, reaching all the way to Remote Oceania and Madagascar. Aside from being used for cuisine, ginger appears to have significant religious and medicinal roles in early Austronesian cultures, based on the glosses it acquired. Ginger were chewed by shamans and spat out intermittently in rituals for healing, warding, and blessing ships. In Proto-Austronesian, the terms for ginger can be reconstructed to *dukduk. With cognates including Pazeh dukuduk; Thao suksuk; Tsou cucʻu; and Saaroa suusuku. This was replaced by *laqia in languages south of Taiwan. The terms for ginger beyond Taiwan can be reconstructed to Proto-Malayo-Polynesian *laqia, which became Proto-Oceanic *laqia and Proto-Central Polynesian *laya. Cognates include Ilocano, Agta, Isneg, Itawis, Kankana-ey, and Casiguran Dumagat layá; Bontoc, Ifugao and Kapampangan láya; Batad Ifugao lāya; Tagalog luya; Bikol láʻya; Visayan luyʻa; Tboli leʻiye; Kadazan Dusun hazo; Tombonuwo and Abai Sembuak layo; Ida'an Begak lejo; Basap, Long Anap Kenyah, Sangir, and Tontemboan lia; Lun Dayeh and Kelabit lieh; Berawan and Miriʼ lejeh; Narum lejieh; Kenyah (Òma Lóngh) lezó; Murik and Iban liaʻ; Kelai and Wahau Kenyah jeʻ; Segai aljoʻ; Modang lejao̯ʻ; Kiput lecih; Bintulu leza; Iban liaʻ; Dayak roiʻi; Jarai reya; Malay halia; Tialo loía; Balaesang láia; Bare'e leʻia; Tae laia or laya; Makasarese laia; Muna longhia; Bimanese rea; Manggarai, Roti, Erai, Leti, Wetan. and Lamaholot lia; and Sika and Ngadha lea; Kowiai and Kei leii. In Oceanic languages, cognates include Lou and Kairiru lei; Penchal lai; Ahus and Kurti liy; Drehet lip; Lindrow ley; Mussau and Wuvulu, Neham laia; Tanga lae; Lakalai la lahia; Gitua laea; Wedau naia; 'Āre'āre and Arosi ria; Sa'a lie; and Fijian cango laya. Bitter ginger (Zingiber zerumbet) is native to tropical Asia and Australasia. Like the ginger, was carried by Austronesian settlers all the way to Remote Oceania during prehistoric times. Thus it is likely that it was originally domesticated by Austronesians. Remains of bitter ginger have also been identified from the Kuk Swamp archaeological site in New Guinea at the Phase 1 layers dated to 10,220 to 9,910 BP. However, whether they were cultivated or simply exploited from the wild is unknown. Bitter ginger is primarily used for traditional medicine. It also has mildly psychoactive properties when consumed, and thus had ritual importance among early Austronesian cultures. According to Lynch (2002), terms for bitter ginger in the sense of "bitter root" or "potent root [used as fish poison]", reconstructed as Proto-Oceanic *kawaRi, is believed to have been transferred to the kava (Piper methysticum), which has similar properties and is also bitter-tasting, when Austronesians of the Lapita culture first encountered it among the indigenous non-Austronesian peoples in Melanesia. Some reflexes of it still refer to bitter ginger, including Sissano (una)kaw; Gapapaiwa kaware; Tikopia, Anutan, and Wallisian kava-pui; Samoan ʻava-pui; Tahitian ava-puhi; and Hawaiian ʻawa-puhi. Other reflexes also refer to other members of the genus Piper, to fish poison, or as words to describe bitter, sour, or acrid flavors. 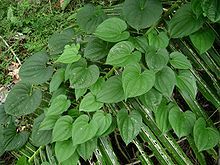 In non-Oceanic languages, terms for bitter ginger can be reconstructed to Proto-Western Malayo-Polynesian *lampuyaŋ, with cognates including Cebuano and Ngaju Dayak lampuyang; and Malay lempoyang. Dogs were primarily valued for their social functions in various Austronesian cultures, acting as companions and pets. They were also trained to be hunting or guard dogs. Ornaments made from dog fur, teeth, and bones are found in archaeological sites throughout Austronesia. These could be traded as commodities, along with dog pups. Dogs were also sometimes eaten, but this varies by culture, with most groups refusing to eat dogs, while in others they were apparently a main food source. The origins of the dog (Canis lupus familiaris) population in Island Southeast Asia, Australia, and New Guinea are contentious, with various authors proposing origins from either Mainland Southeast Asia, Taiwan, or both at different times. These introduction events have been linked to the origin of the Australian dingoes and the New Guinea singing dogs, both of which are clearly descended from domesticated dogs. The specifics of which population they are derived from, who introduced them, and whether they come from a common ancestor, however, still do not have a consensus. Regardless, most authors agree that there were at least two introduction events. One arriving with Paleolithic maritime hunter-gatherers by at least 10,000 to 5,000 BP, and another arriving with later Neolithic migrations of farming and trading cultures (including those of Austronesians) by at least 5,000 BP. The Neolithic dogs are differentiated from previous populations in having the ability to digest starch, indicating that they accompanied humans that cultivated cereal crops. The Neolithic introductions are believed to have partially replaced the original introductions and became the ancestors of the modern village dogs of Southeast Asia. Unlike the first wave, they have adaptations that enable them to digest starch, indicating that they accompanied cultivators of cereal crops. The oldest archaeological remains of dogs in Island Southeast Asia and Oceania is a dog burial in Timor and dingo remains in Australia, both of which are dated to around 3,500 BP. The former are believed to have been part of the second wave and the latter from the first wave. From Island Southeast Asia, they were carried by Austronesian voyagers into Near Oceania. Dogs, however, were rare in Lapita culture archaeological sites. Some authors have suggested that Austronesian dogs were "lost" during the early colonization of Near Oceania, purportedly because they were less useful in small island environments. This is said to be the reason for the discontinuity for the terms for "dog" in languages in Southeast Asia, New Guinea, Island Melanesia, and the Pacific Islands. The dog remains in Lapita therefore may have been from individual dogs and dog ornaments acquired from traders from Southeast Asia or more likely from neighboring non-Lapita cultures in New Guinea, where dogs were widely present. But this remains a hypothesis. Nevertheless, dogs were subsequently carried eastward into Polynesia by post-Lapita Austronesian migrations, reaching as far as Hawaii and Aotearoa. Genetic studies have shown that Polynesian dogs are apparently descended from the first wave of dog introductions and are not related to the dogs originating from Taiwan and the Philippines, though this may be an artifact of a founder effect. However, dogs were not introduced to Madagascar by Austronesians. A genetic study by Ardalan et al. (2015) revealed that the dog population in Madagascar were all derived solely from African dog populations and did not come from Southeast Asian dog populations. This aberrant origin is also reflected in the Malagasy languages, where the terms for "dog" originate entirely from African Bantu languages. Given the inferred importance of dogs to Austronesian voyagers, the authors proposed that the Austronesian settlers in Madagascar may have initially brought dogs, but they either died or were used as food sources during the journey. Another possibility is that the limited initial number of Austronesian dogs may have simply resulted in their genes getting swamped by the influx of a far larger population of dogs from Africa. Junglefowl were one of the three main animals (along with domesticated pigs and dogs) carried by early Austronesian peoples from Island Southeast Asia in their voyages to the islands of Oceania. Pigs were one of the three main animals (along with domesticated chickens and dogs) carried by early Austronesian peoples from Island Southeast Asia in their voyages to the islands of Oceania. ^ Bellwood, Peter (2004). "The origins and dispersals of agricultural communities in Southeast Asia" (PDF). In Glover, Ian; Bellwood, Peter (eds.). Southeast Asia: From Prehistory to History. RoutledgeCurzon. pp. 21–40. ISBN 9780415297776. ^ Reilly, Kevin (2012). Volume I: Prehistory to 1450. The Human Journey: A Concise Introduction to World History. 1. Rowman & Littlefield Publishers, Inc. pp. 207–209. ISBN 9781442213869. ^ Liu, Li; Chen, Xingcan (2012). "Emergence of social inequality – The middle Neolithic (5000–3000 BC)". The Archaeology of China: From the Late Paleolithic to the Early Bronze Age. Cambridge World Archaeology. Cambridge University Press. p. 204. doi:10.1017/CBO9781139015301.007. ISBN 9780521644327. ^ Bourke, Richard Michael (2009). "History of agriculture in Papua New Guinea" (PDF). In Bourke, Richard Michael; Harwood, Tracy (eds.). Food and Agriculture in Papua New Guinea. ANU E Press. pp. 10–26. doi:10.22459/FAPNG.08.2009. ISBN 9781921536618. ^ a b c d e Denham, Tim (October 2011). "Early Agriculture and Plant Domestication in New Guinea and Island Southeast Asia". Current Anthropology. 52 (S4): S379–S395. doi:10.1086/658682. ^ Kitalong, Ann Hillmann; Ballick, MichaelJ. ; Rehuher, Faustina; Besebes, Meked; Hanser, Sholeh; Soaladaob, Kiblas; Ngirchobong, Gemma; Wasisang, Flora; Law, Wayne; Lee, Roberta; Tadeo, Van Ray; Kitalong, Clarence; Kitalong, Christopher (2011). "Plants, people and culture in the villages of Oikull and Ibobang, Republic of Palau". In Liston, Jolie; Clark, Geoffrey; Alexander, Dwight (eds.). Pacific Island Heritage: Archaeology, Identity & Community. Terra Australis. 35. ANU E Press. pp. 63–84. ISBN 9781921862489. ^ Theroux, Paul (December 2002). "The Hawaiians". National Geographic. 202 (6): 2–41. ^ a b c Blench, Roger (2004). "Fruits and arboriculture in the Indo-Pacific region". Bulletin of the Indo-Pacific Prehistory Association. 24 (The Taipei Papers (Volume 2)): 31–50. ^ Simanjuntak, Truman (2006). "Advancement of Research on the Austronesian in Sulawesi". In Simanjuntak, Truman; Hisyam, M.; Prasetyo, Bagyo; Nastiti, Titi Surti (eds.). Archaeology: Indonesian Perspective : R.P. Soejono's Festschrift. Indonesian Institute of Sciences (LIPI). pp. 223–231. ISBN 9789792624991. ^ Hasanuddin (2018). "Prehistoric sites in Kabupaten Enrekang, South Sulawesi". In O'Connor, Sue; Bulbeck, David; Meyer, Juliet (eds.). The Archaeology of Sulawesi: Current Research on the Pleistocene to the Historic Period. terra australis. 48. ANU Press. pp. 171–189. doi:10.22459/TA48.11.2018.11. ISBN 9781760462574. ^ Larrue, Sébastien; Meyer, Jean-Yves; Chiron, Thomas (2010). "Anthropogenic Vegetation Contributions to Polynesia's Social Heritage: The Legacy of Candlenut Tree (Aleurites moluccana) Forests and Bamboo (Schizostachyum glaucifolium) Groves on the Island of Tahiti". Economic Botany. 64 (4): 329–339. doi:10.1007/s12231-010-9130-3. ^ Kirch, Patrick V. (1989). "Second Millennium B.C. Arboriculture in Melanesia: Archaeological Evidence from the Mussau Islands". Economic Botany. 43 (2): 225–240. doi:10.1007/BF02859865. ^ Elevitch, Craig R.; Manner, Harley I. (2006). "Aleurites moluccana (kukui)". In Elevitch, Craig R. (ed.). Traditional Trees of Pacific Islands: Their Culture, Environment, and Use. Permanent Agricultural Resources (PAR). pp. 41–56. ISBN 9780970254450. ^ a b c d e f g h i j k l m n o p q r s t u v w x y z aa ab ac ad ae af ag ah ai aj ak al am an ao ap aq ar as at Blust, Robert; Trussel, Stephen (2013). "The Austronesian Comparative Dictionary: A Work in Progress". Oceanic Linguistics. 52 (2): 493–523. doi:10.1353/ol.2013.0016. ^ a b c d e f g h i j k l Osmond, Meredith (1998). "Horticultural practices" (PDF). In Ross, Malcolm; Pawley, Andrew; Osmond, Meredith (eds.). The lexicon of Proto Oceanic : The culture and environment of ancestral Oceanic society. Vol. 1: Material Culture. Pacific Linguistics. pp. 115–142. doi:10.15144/PL-C152.115. ^ Nauheimer, Lars; Boyce, Peter C.; Renner, Susanne S. (April 2012). "Giant taro and its relatives: A phylogeny of the large genus Alocasia (Araceae) sheds light on Miocene floristic exchange in the Malesian region". Molecular Phylogenetics and Evolution. 63 (1): 43–51. doi:10.1016/j.ympev.2011.12.011. PMID 22209857. ^ Manner, Harley I. (2006). "Farm and Forestry Production Marketing Profile for Giant Tao (Alocasia macrorrhiza)" (PDF). In Elevitch, Craig R. (ed.). Specialty Crops for Pacific Island Agroforestry. Permanent Agricultural Resource (PAR). ^ a b c Matthews, Peter J. (1995). "Aroids and the Austronesians". Tropics. 4 (2/3): 105–126. doi:10.3759/tropics.4.105. ^ Santosa, Edi; Lian, Chun Lan; Sugiyama, Nobuo; Misra, Raj Shekhar; Boonkorkaew, Patchareeya; Thanomchit, Kanokwan; Chiang, Tzen-Yuh (28 June 2017). "Population structure of elephant foot yams (Amorphophallus paeoniifolius (Dennst.) Nicolson) in Asia". PLOS ONE. 12 (6): e0180000. doi:10.1371/journal.pone.0180000. ^ a b c McClatchey, Will C. (2012). "Wild food plants of Remote Oceania". Acta Societatis Botanicorum Poloniae. 81 (4): 371–380. doi:10.5586/asbp.2012.034. ^ Horrocks, M; Nieuwoudt, MK; Kinaston, R; Buckley, H; Bedford, S (13 November 2013). "Microfossil and Fourier Transform InfraRed analyses of Lapita and post-Lapita human dental calculus from Vanuatu, Southwest Pacific". Journal of the Royal Society of New Zealand. 44 (1): 17–33. doi:10.1080/03036758.2013.842177. ^ a b c d e f g h i j k McLean, Mervyn (2014). Music, Lapita, and the Problem of Polynesian Origins. Polynesian Origins. ISBN 9780473288730. ^ a b Lim, T.K. (2012). Edible Medicinal and Non-Medicinal Plants. Springer. ISBN 9789048186617. ^ Orwa, C.; Mutua, A.; Kindt, R.; Jamnadass, R.; Anthony, S. (2009). Artocarpus heterophyllus (PDF). Agroforestree Database:a tree reference and selection guide v.4.0. World Agroforestry. ^ Mônica M., de Almeida-Lopes; de Souza, Kellina O.; Ebenezer, de Oliveira-Silva (2018). "Cempedak—Artocarpus champeden". In Rodrigues, Sueli; de Oliveira-Silva, Ebenezer; de Brito, Edy Sousa (eds.). Exotic Fruits: Reference Guide. Academic Press. pp. 121–127. doi:10.1016/B978-0-12-803138-4.00017-4. ISBN 9780128031384. ^ Orwa, C.; Mutua, A.; Kindt, R.; Jamnadass, R.; Anthony, S. (2009). Artocarpus lakoocha (PDF). Agroforestree Database:a tree reference and selection guide v.4.0. World Agroforestry. ^ Orwa, C.; Mutua, A.; Kindt, R.; Jamnadass, R.; Anthony, S. (2009). Artocarpus mariannensis (PDF). Agroforestree Database:a tree reference and selection guide v.4.0. World Agroforestry. ^ Abu Bakar, Fazleen Izzany; Abu Bakar, Mohd Fadzelly (2018). "Tarap—Artocarpus odoratissimus". In Rodrigues, Sueli; de Oliveira-Silva, Ebenezer; de Brito, Edy Sousa (eds.). Exotic Fruits: Reference Guide. Academic Press. pp. 413–418. doi:10.1016/B978-0-12-803138-4.00041-1. ISBN 9780128031384. ^ Madulid, Domingo A. (6 August 2011). "Artocarpus treculianus". Philippine Native Plants. The Philippine Star. Retrieved 14 January 2019. ^ a b Ragone, Diane (2006). "Artocarpus camansi (breadnut)" (PDF). In Elevitch, Craig R. (ed.). Species Profiles for Pacific Island Agroforestry. Permanent Agriculture Resources (PAR). ^ Zerega, N. J. C.; Ragone, D. & Motley, T.J. (2004). "The complex origins of breadfruit (Artocarpus altilis, Moraceae): Implications for human migrations in Oceania". American Journal of Botany. 91 (5): 760–766. doi:10.3732/ajb.91.5.760. PMID 21653430. ^ Matisoo-Smith, Elizabeth A. (3 November 2015). "Tracking Austronesian expansion into the Pacific via the paper mulberry plant". Proceedings of the National Academy of Sciences. 112 (44): 13432–13433. doi:10.1073/pnas.1518576112. PMC 4640783. PMID 26499243. ^ a b "*Kulu". Te Mära Reo: The Language Garden. Benton Family Trust. Retrieved 15 January 2019. ^ Blust, Robert (1989). "Austronesian Etymologies: IV". Oceanic Linguistics. 28 (2): 111–180. doi:10.2307/3623057. JSTOR 3623057. ^ Hull, Geoffrey (2000). "Historical phonology of Tetum". Studies in Languages and Cultures of East Timor. 3 (2000): 158–212. ^ a b Blench, Roger (2008). "A history of fruits on the Southeast Asian mainland" (PDF). In Osada, Toshiki; Uesugi, Akinori (eds.). Occasional Paper 4: Linguistics, Archaeology and the Human Past. Indus Project. pp. 115–137. ISBN 9784902325331. ^ a b "*Kofe". Te Mära Reo: The Language Garden. Benton Family Trust. Retrieved 15 January 2019. ^ Bellwood, Peter (2009). "Archaeology and the Origins of Language Families". In Bentley, R. Alexander; Maschner, Herbert D.G. ; Chippindale, Christopher (eds.). Handbook of Archaeological Theories. AltaMira Press. pp. 225–244. ISBN 9780759100336. ^ Fowler, Cynthia (2005). "Why is maize a sacred plant? Social history and agrarian change in Sumba" (PDF). Journal of Ethnobiology. 25 (1): 39–57. doi:10.2993/0278-0771(2005)25[39:WIMASP]2.0.CO;2. ^ a b c Chang, Chi-Shan; Liu, Hsiao-Lei; Moncada, Ximena; Seelenfreund, Andrea; Seelenfreund, Daniela; Chung, Kuo-Fang (2015). "A holistic picture of Austronesian migrations revealed by phylogeography of Pacific paper mulberry". Proceedings of the National Academy of Sciences. 112 (44): 13537–13542. doi:10.1073/pnas.1503205112. ^ a b c Seelenfreund, Daniela; Clarke, Andrew C.; Oyanedel-Giaverini, Naria Factina; Piña-Muñoz, Ricardo; Lobos, Sergio; Matisoo-Smith, Lisa; Seelenfreund, A. (September 2010). "Paper mulberry (Broussonetia papyrifera) as a commensal model for human mobility in Oceania: Anthropological, botanical and genetic considerations". New Zealand Journal of Botany. 48 (3–4): 231–247. doi:10.1080/0028825X.2010.520323. ^ González-Lorca, J.; Rivera-Hutinel, A.; Moncada, X.; Lobos, S.; Seelenfreund, D.; Seelenfreund, A. (2 April 2015). "Ancient and modern introduction of Broussonetia papyrifera ([L.] Vent. ; Moraceae) into the Pacific: genetic, geographical and historical evidence". New Zealand Journal of Botany. 53 (2): 75–89. doi:10.1080/0028825X.2015.1010546. ^ Li, Dawei; Wang, Wei; Tian, Feng; Liao, Wei; Bae, Christopher J. (December 2014). "The oldest bark cloth beater in southern China (Dingmo, Bubing basin, Guangxi)". Quaternary International. 354: 184–189. doi:10.1016/j.quaint.2014.06.062. ^ "*Aute". Te Mära Reo: The Language Garden. Benton Family Trust. Retrieved 15 January 2019. ^ a b c Orwa, C.; Mutua, A.; Kindt, R.; Anthony, S. (2009). "Calophyllum inophyllum" (PDF). Agroforestree Database:a tree reference and selection guide version 4.0. World Agroforestry. ^ a b c d Damon, Frederick H. (2016). "A Story of Calophyllum: From Ecological to Social Facts". Trees, Knots, and Outriggers: Environmental Knowledge in the Northeast Kula Ring. Berghahn Books. pp. 180–246. ISBN 9781785332333. ^ a b Dweck, A.C.; Meadows, T. (2002). "Tamanu (Calophyllum inophyllum) – the African, Asian, Polynesian and Pacific Panacea" (PDF). International Journal of Cosmetic Science. 24 (6): 341–348. doi:10.1046/j.1467-2494.2002.00160.x. PMID 18494888. ^ Halpern, Georges M.; Weverka, Peter (2002). The Healing Trail: Essential Oils of Madagascar. Basic Health Publications, Inc. pp. 43–50. ISBN 9781591200161. ^ Allen, James A. (2002). "Calophyllum inophyllum" (PDF). In Vozzo, J.A. (ed.). Tropical Tree Seed Manual. Agriculture Handbook. 721. US Department of Agriculture Forest Service. pp. 357–359. ^ Zorc, R. David (1995). "A Glossary of Austronesian Reconstructions". In Tryon, Darrell T.; Ross, Malcolm D.; Grimes, Charles E.; Clynes, Adrian; Adelaar, K.A. (eds.). Comparative Austronesian Dictionary: An Introduction to Austronesian Studies. Trends in Linguistics Documentation. 10. Mouton de Gruyter. ISBN 9783110884012. ^ a b c d e f Gunn, Bee F.; Baudouin, Luc; Olsen, Kenneth M.; Ingvarsson, Pär K. (22 June 2011). "Independent Origins of Cultivated Coconut (Cocos nucifera L.) in the Old World Tropics". PLoS ONE. 6 (6): e21143. doi:10.1371/journal.pone.0021143. PMC 3120816. PMID 21731660. ^ Lutz, Diana (24 June 2011). "Deep history of coconuts decoded". The Source. Retrieved 10 January 2019. ^ a b Brouwers, Lucas (1 August 2011). "Coconuts: not indigenous, but quite at home nevertheless". Scientific American. Retrieved 10 January 2019. ^ Lalith, Perera; Suriya A.C.N., Perera; Champa K., Bandaranayake; Hugh C., Harries (2009). "Coconut". In Vollmann, Johann; Rajcan, Istvan (eds.). Oil Crops. Springer. pp. 370–372. ISBN 9780387775937. ^ Chan, Edward; Elevitch, Craig R. (2006). "Cocos nucifera (coconut)" (PDF). In Elevitch, Craig R. (ed.). Species Profiles for Pacific Island Agroforestry. Permanent Agriculture Resources (PAR). ^ a b Baudouin, Luc; Lebrun, Patricia (26 July 2008). "Coconut (Cocos nucifera L.) DNA studies support the hypothesis of an ancient Austronesian migration from Southeast Asia to America". Genetic Resources and Crop Evolution. 56 (2): 257–262. doi:10.1007/s10722-008-9362-6. ^ a b c Crowther, Alison; Lucas, Leilani; Helm, Richard; Horton, Mark; Shipton, Ceri; Wright, Henry T.; Walshaw, Sarah; Pawlowicz, Matthew; Radimilahy, Chantal; Douka, Katerina; Picornell-Gelabert, Llorenç; Fuller, Dorian Q.; Boivin, Nicole L. (14 June 2016). "Ancient crops provide first archaeological signature of the westward Austronesian expansion". Proceedings of the National Academy of Sciences. 113 (24): 6635–6640. doi:10.1073/pnas.1522714113. PMID 27247383. ^ Blust, Robert (1988). "The Austronesian Homeland: A Linguistic Perspective" (PDF). Asian Perspectives. 26 (1): 45–67. ^ Elbert, Samuel H. (1964). "Hawaiian reflexes of Proto-Malayo-Polynesian and Proto-Polynesian reconstructed forms". The Journal of the Polynesian Society. 73 (4): 399–410. ^ Blust, Robert (2014). "Some Recent Proposals Concerning the Classification of the Austronesian Languages". Oceanic Linguistics. 53 (2): 300–391. doi:10.1353/ol.2014.0025. ^ Ahuja, S.C.; Ahuja, Siddharth; Ahuja, Uma (2014). "Coconut – History, Uses, and Folklore" (PDF). Asian Agri-History. 18 (3): 221–248. ^ Ward, R. G.; Brookfield, M. (1992). "Special Paper: the dispersal of the coconut: did it float or was it carried to Panama?". Journal of Biogeography. 19 (5): 467–480. doi:10.2307/2845766. JSTOR 2845766. ^ Kreike, C.M. ; Van Eck, H.J. ; Lebot, V. (20 May 2004). "Genetic diversity of taro, Colocasia esculenta (L.) Schott, in Southeast Asia and the Pacific". Theoretical and Applied Genetics. 109 (4): 761–768. doi:10.1007/s00122-004-1691-z. PMID 15156282. ^ a b c Chaïr, H.; Traore, R. E.; Duval, M. F.; Rivallan, R.; Mukherjee, A.; Aboagye, L. M.; Van Rensburg, W. J.; Andrianavalona, V.; Pinheiro de Carvalho, M. A. A.; Saborio, F.; Sri Prana, M.; Komolong, B.; Lawac, F.; Lebot, V.; Chiang, Tzen-Yuh (17 June 2016). "Genetic Diversification and Dispersal of Taro (Colocasia esculenta (L.) Schott)". PLOS ONE. 11 (6): e0157712. doi:10.1371/journal.pone.0157712. PMC 4912093. PMID 27314588. ^ Matthews, P.J. ; Agoo, E.M.G. ; Tandang, D.N. ; Madulid, D.A. (2012). "Ethnobotany and Ecology of Wild Taro (Colocasia esculenta) in the Philippines: Implications for Domestication and Dispersal" (PDF). In Spriggs, Matthew; Addison, David; Matthews, Peter J. (eds.). Irrigated Taro (Colocasia esculenta) in the Indo‐Pacific: Biological, Social and Historical Perspectives. Senri Ethnological Studies (SES). 78. National Museum of Ethnology, Osaka. pp. 307–340. ISBN 9784901906937. ^ a b c d Barker, Graeme; Lloyd-Smith, Lindsay; Barton, Huw; Cole, Franca; Hunt, Chris; Piper, Philip J.; Rabett, Ryan; Paz, Victor; Szabó, Katherine (2011). "Foraging-farming transitions at the Niah Caves, Sarawak, Borneo" (PDF). Antiquity. 85 (328): 492–509. doi:10.1017/S0003598X00067909. ^ a b Balbaligo, Yvette (15 November 2007). "A Brief Note on the 2007 Excavation at Ille Cave, Palawan, the Philippines". Papers from the Institute of Archaeology. 18 (2007): 161. doi:10.5334/pia.308. ^ Loy, Thomas H.; Spriggs, Matthew; Wickler, Stephen (1992). "Direct evidence for human use of plants 28,000 years ago: starch residues on stone artefacts from the northern Solomon Islands". Antiquity. 66 (253): 898–912. doi:10.1017/S0003598X00044811. ^ Barker, Graeme; Hunt, Chris; Carlos, Jane (2011). "Transitions to Farming in Island Southeast Asia: Archaeological, Biomolecular and Palaeoecological Perspectives" (PDF). In Barker, Grame; Janowski, Monica (eds.). Why cultivate? Anthropological and Archaeological Approaches to Foraging–Farming Transitions in Southeast Asia. McDonald Institute for Archaeological Research. pp. 61–74. ISBN 9781902937588. ^ Barton, Huw (2012). "The reversed fortunes of sago and rice, Oryza sativa, in the rainforests of Sarawak, Borneo" (PDF). Quaternary International. 249: 96–104. doi:10.1016/j.quaint.2011.03.037. ^ "*Talo/Taro". Te Mära Reo: The Language Garden. Benton Family Trust. Retrieved 18 January 2019. ^ a b c Friday, J.B.; Okano, Dana (2006). "Cordia subcordata (kou)" (PDF). In Elevitch, Craig R. (ed.). Species Profiles for Pacific Island Agroforestry. Permanent Agriculture Resources (PAR). ^ Ono, Rintaro; Addison, David J. (2013). "Historical Ecology and 600 Years of Fish Use on Atafu Atoll, Tokelau". In Ono, Rintaro; Morrison, Alex; Addison, David J. (eds.). Prehistoric Marine Resource Use in the Indo-Pacific Regions. terra australis. 39. ANU E Press. ISBN 9781925021264. ^ Sudarmin, M.Si; Pujiastuti, Sri Endang (2015). "Scientific Knowledge Based Culture and Local Wisdom in Karimunjawa for Growing Soft Skills Conservation" (PDF). International Journal of Science and Research. 4 (9): 598–604. ^ Boerger, Brenda H. (2009). "Trees of Santa Cruz Island and their Metaphors" (PDF). Proceedings of the Seventeeth Annual Symposium About Language and Society, Austin. Texas Linguistic Forum. 53. pp. 100–109. ^ Kahn, Jennifer G.; Coil, James H. (2006). "What House Posts Tell Us about Status Difference in Prehistoric Society: An Interpretation of Charcoal Analysis, Sacred Woods and Inter-site Variability" (PDF). The Journal of the Polynesian Society. 115 (4): 319–352. ^ Pebble, Matthew (2008). "No fruit on that beautiful shore: What plants were introduced to the subtropical Polynesian islands prior to European contact?" (PDF). In Clark, Geoffrey Richard; O'Connor, Sue; Leach, Bryan Foss (eds.). Islands of Inquiry: Colonisation, Seafaring and the Archaeology of Maritime Landscapes. terra australis. 29. ANU E Press. pp. 227–251. ISBN 9781921313905. ^ Millerstrom, Sidsel; Coil, James H. (2008). 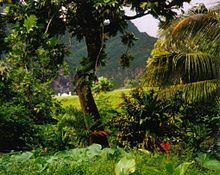 "Pre-Contact Arboriculture and Vegetation in the Marquesas Islands, French Polynesia: Charcoal Identification and Radiocarbon Dates from Hatiheu Valley, Nuku Hiva" (PDF). Asian Perspectives. 47 (2): 330–351. doi:10.1353/asi.0.0005. ^ Green, Valerie J.; Green, Roger C. (2007). "An Accent on Atolls in Approaches to Population Histories of Remote Oceania". In Kirch, Patrick V.; Rallu, Jean-Louis (eds.). The Growth and Collapse of Pacific Island Societies: Archaeological and Demographic Perspectives. University of Hawai'i Press. pp. 232–256. ISBN 9780824831349. ^ Trisha, Borland (2009). "Cordyline fruticosa: the distribution and continuity of a sacred plant" (PDF). UCB Moorea Class: Biology and Geomorphology of Tropical Islands. Student Research Papers, Fall 2009. University of California. ^ Lense, Obed (1 April 2012). "The wild plants used as traditional medicines by indigenous people of Manokwari, West Papua". Biodiversitas, Journal of Biological Diversity. 13 (2): 98–106. doi:10.13057/biodiv/d130208. ^ Dahlia, Andi Amalia; Aktsar, Roskiana Ahmad; Wahid, Milhawati (2013). "Extraction of color pigment and determination of flavonoid content of andong leaves (Cordyline fruticosa) source Makassar City". Journal of Biological & Scientific Opinion. 1 (4). ^ Loeb, E.M. (1929). "Shaman and Seer". American Anthropologist. 31 (1): 60–84. doi:10.1525/aa.1929.31.1.02a00050. ^ Nooy-Palm, Hetty (1979). The Sa'dan-Toraja: A Study of Their Social Life and Religion. Verhandelingen van het Koninklijk Instituut voor Taal-, Land- en Volkenkunde. 87. Springer. p. 225. ISBN 9789401771504. ^ Rappaport, Roy A. (1967). "Ritual Regulation of Environmental Relations among a New Guinea People". Ethnology. 6 (1): 17–30. CiteSeerX 10.1.1.460.3366. doi:10.2307/3772735. JSTOR 3772735. ^ Nombo, Porer; Leach, James (2010). "Reite Plants: An Ethnobotanical Study in Tok Pisin and English" (PDF). Asia-Pacific Environment Monograph. 4. ANU E Press. ISBN 9781921666018. ^ a b Moore, Darlene R. (2005). "Archaeological Evidence of a Prehistoric Farming Technique on Guam" (PDF). Micronesica. 38 (1): 93–120. ^ a b "*Tï". Te Mära Reo: The Language Garden. Benton Family Trust. Retrieved 15 January 2019. ^ a b Barker, Graeme; Hunt, Chris; Barton, Huw; Gosden, Chris; Jones, Sam; Lloyd-Smith, Lindsay; Farr, Lucy; Nyirí, Borbala; O'Donnell, Shawn (August 2017). "The 'cultured rainforests' of Borneo". Quaternary International. 448: 44–61. doi:10.1016/j.quaint.2016.08.018. ^ Bevacqua, Robert F. (1994). "Origin of Horticulture in Southeast Asia and the Dispersal of Domesticated Plants to the Pacific Islands by Polynesian Voyagers: The Hawaiian Islands Case Study" (PDF). HortScience. 29 (11): 1226–1229. doi:10.21273/HORTSCI.29.11.1226. ^ a b c Beaujard, Philippe (August 2011). "The first migrants to Madagascar and their introduction of plants: linguistic and ethnological evidence". Azania: Archaeological Research in Africa. 46 (2): 169–189. doi:10.1080/0067270X.2011.580142. ^ Walter, Annie; Lebot, Vincent (2007). Gardens of Oceania. IRD Éditions-CIRAD. ISBN 9781863204705. ^ a b c d e "*Qufi ~ Uwhi, uhi". Te Mära Reo: The Language Garden. Benton Family Trust. Retrieved 21 January 2019. ^ Malapa, R.; Arnau, G.; Noyer, J.L. ; Lebot, V. (November 2005). "Genetic Diversity of the Greater Yam (Dioscorea alata L.) and Relatedness to D. nummularia Lam. and D. transversa Br. as Revealed with AFLP Markers". Genetic Resources and Crop Evolution. 52 (7): 919–929. doi:10.1007/s10722-003-6122-5. ^ Cruz, V.M.V. ; Altoveros, N.C.; Mendioro, M.S. ; Ramirez, D.A. (1999). "Geographical patterns of diversity in the Philippine edible yam collection". Plant Genetic Resources Newsletter. 119: 7–11. ^ Paz, Victor J. (1999). "Neolithic Human Movement to Island Southeast Asia: The Search for Archaeobotanical Evidence". Indo-Pacific Prehistory Association Bulletin. 18 (Melaka Papers Vol. 2): 151–158. doi:10.7152/bippa.v18i0.11710. ^ a b Bayliss-Smith, Tim; Golson, Jack; Hughes, Philip (2017). "Phase 4: Major Disposal Channels, Slot-Like Ditches and Grid-Patterned Fields". In Golson, Jack; Denham, Tim; Hughes, Philip; Swadling, Pamela; Muke, John (eds.). Ten Thousand Years of Cultivation at Kuk Swamp in the Highlands of Papua New Guinea. terra australis. 46. ANU Press. pp. 239–268. ISBN 9781760461164. ^ Barton, Huw (2005). "The Case for Rainforest Foragers: The Starch Record at Niah Cave, Sarawak" (PDF). Asian Perspectives. 44 (1): 56–72. doi:10.1353/asi.2005.0005. ^ Barton, Huw; Denham, Timothy (2011). "Prehistoric vegeculture and social life in Island Southeast Asia and Melanesia" (PDF). In Barker, Grame; Janowski, Monica (eds.). Why cultivate? Anthropological and Archaeological Approaches to Foraging–Farming Transitions in Southeast Asia. McDonald Institute for Archaeological Research. pp. 61–74. ISBN 9781902937588. ^ Reynolds, Tim; Barker, Graeme; Barton, Huw; Cranbrook, Gathorne; Hunt, Chris; Kealhofer, Lisa; Paz, Victor; Pike, Alasdair; Piper, Philip; Rabett, Ryan; Rushworth, Gary; Stimpson, Christopher; Szabó, Katherine (2013). "The First Modern Humans at Niah, c. 50,000–35,000 Years Ago" (PDF). In Barker, Graeme (ed.). Rainforest Foraging and Farming in Island Southeast Asia. McDonald Institute for Archaeological Research. pp. 133–170. ISBN 9781902937540. ^ "Dioscorea bulbifera – Air Yam". Hawaiian Plants and Tropical Flowers. Retrieved 21 January 2019. ^ Andres, C.; AdeOluwa, O.O. ; Bhullar, G.S. (2016). "Yam (Dioscorea spp.)". In Thomas, Brian; Murphy, Denis J.; Murray, Brian G. (eds.). Encyclopedia of Applied Plant Sciences (2nd ed.). Academic Press. pp. 435–441. ISBN 9780123948076. ^ Blench, Roger (2010). "Evidence for the Austronesian Voyages in the Indian Ocean" (PDF). In Anderson, Atholl; Barrett, James H.; Boyle, Katherine V. (eds.). The Global Origins and Development of Seafaring. McDonald Institute for Archaeological Research. pp. 239–248. ISBN 9781902937526. ^ a b c Hoogervorst, Tom (2013). "If Only Plants Could talk...: Reconstructing Pre-Modern Biological Translocations in the Indian Ocean" (PDF). In Chandra, Satish; Prabha Ray, Himanshu (eds.). The Sea, Identity and History: From the Bay of Bengal to the South China Sea. Manohar. pp. 67–92. ISBN 9788173049866. ^ Kirch, Patrick Vinton; Green, Roger C. (2001). Hawaiki, Ancestral Polynesia: An Essay in Historical Anthropology. Cambridge University Press. p. 267. ISBN 9780521788793. ^ Sykes, W. R. (December 2003). "Dioscoreaceae, new for the adventive flora of New Zealand". New Zealand Journal of Botany. 41 (4): 727–730. doi:10.1080/0028825X.2003.9512884. ^ White, Lynton Dove. "Uhi". Na Meakanu o Wa`a o Hawai`i Kahiko: The "Canoe Plants" of Ancient Hawai`i. Retrieved 21 January 2019. ^ Horrocks, Mark; Nunn, Patrick D. (May 2007). 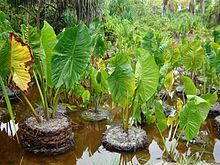 "Evidence for introduced taro (Colocasia esculenta) and lesser yam (Dioscorea esculenta) in Lapita-era (c. 3050–2500cal.yrBP) deposits from Bourewa, southwest Viti Levu Island, Fiji". Journal of Archaeological Science. 34 (5): 739–748. doi:10.1016/j.jas.2006.07.011. ^ Horrocks, M.; Grant-Mackie, J.; Matisoo-Smith, E. (January 2008). "Introduced taro (Colocasia esculenta) and yams (Dioscorea spp.) in Podtanean (2700–1800years BP) deposits from Mé Auré Cave (WMD007), Moindou, New Caledonia". Journal of Archaeological Science. 35 (1): 169–180. doi:10.1016/j.jas.2007.03.001. ^ Swadling, Pamela; Hide, Robin (2005). "Changing landscape and social interaction: looking at agricultural history from a Sepik–Ramu perspective" (PDF). In Pawley, Andrew; Attenborough, Robert; Golson, Jack; Hide, Robin (eds.). Papuan pasts: cultural, linguistic and biological histories of Papuan-speaking peoples. Pacific Linguistics. pp. 289–327. ISBN 9780858835627. ^ Andrew, Pawley (2017). "Were the First Lapita Colonisers of Remote Oceania Farmers as Well as Foragers?". In Piper, Philip J.; Matsumura, Hirofumi; Bulbeck, David (eds.). New Perspectives in Southeast Asian and Pacific Prehistory. terra australis. 45. ANU Press. p. 293–310. ISBN 9781760460952. ^ Oliveira, Nuno Vasco (2012). "Recovering, Analysing and Identifying Colocasia esculenta and Dioscorea spp. from Archaeological Contexts in Timor-Leste". Senri Ethnological Studies. 78: 265–284. doi:10.15021/00002521. ^ Nelson, Scot C. (2006). "Pandanus tectorius (pandanus)" (PDF). In Elevitch, Craig R. (ed.). Species Profiles for Pacific Island Agroforestry. Permanent Agriculture Resources (PAR). ^ a b c Perrier, Xavier; Bakry, Frédéric; Carreel, Françoise; Jenny, Christophe; Horry, Jean-Pierre; Lebot, Vincent; Hippolyte, Isabelle (2009). "Combining Biological Approaches to Shed Light on the Evolution of Edible Bananas". Ethnobotany Research & Applications. 7: 199–216. doi:10.17348/era.7.0.199-216. ^ a b Ploetz, Randy C.; Kepler, Angela Kay; Daniells, Jeff; Nelson, Scott C. (2007). "Banana and plantain — an overview with emphasis on Pacific island cultivars" (PDF). In Elevitch, Craig R. (ed.). Species Profiles for Pacific Island Agroforestry. Permanent Agriculture Resources (PAR). ^ a b c d e f g h Bellwood, Peter (9 December 2011). "The Checkered Prehistory of Rice Movement Southwards as a Domesticated Cereal—from the Yangzi to the Equator" (PDF). Rice. 4 (3–4): 93–103. doi:10.1007/s12284-011-9068-9. ^ a b c He, Keyang; Lu, Houyuan; Zhang, Jianping; Wang, Can; Huan, Xiujia (7 June 2017). "Prehistoric evolution of the dualistic structure mixed rice and millet farming in China". The Holocene. 27 (12): 1885–1898. doi:10.1177/0959683617708455. ^ Vaughan, DA; Lu, B; Tomooka, N (2008). "The evolving story of rice evolution". Plant Science. 174 (4): 394–408. doi:10.1016/j.plantsci.2008.01.016. ^ Zhang, Jianping; Lu, Houyuan; Gu, Wanfa; Wu, Naiqin; Zhou, Kunshu; Hu, Yayi; Xin, Yingjun; Wang, Can; Kashkush, Khalil (17 December 2012). "Early Mixed Farming of Millet and Rice 7800 Years Ago in the Middle Yellow River Region, China". PLoS ONE. 7 (12): e52146. doi:10.1371/journal.pone.0052146. PMC 3524165. PMID 23284907. ^ Baba, Shigeyuki; Chan, Hung; Kezuka, Mio; Inoue, Tomomi; Chan, Eric (2016). "Artocarpus altilis and Pandanus tectorius: Two Important Fruits of Oceania with Medicinal Values". Emirates Journal of Food and Agriculture. 28 (8): 531. doi:10.9755/ejfa.2016-02-207. ^ a b c d Gallaher, Timothy (2014). "The Past and Future of Hala (Pandanus tectorius) in Hawaii". In Keawe, Lia O'Neill M.A. ; MacDowell, Marsha; Dewhurst, C. Kurt (eds.). ʻIke Ulana Lau Hala: The Vitality and Vibrancy of Lau Hala Weaving Traditions in Hawaiʻi. Hawai'inuiakea School of Hawaiian Knowledge ; University of Hawai'i Press. doi:10.13140/RG.2.1.2571.4648. ISBN 9780824840938. ^ Kirch, Patrick Vinton (2012). 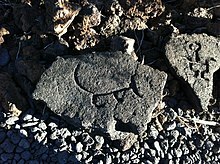 A Shark Going Inland Is My Chief: The Island Civilization of Ancient Hawai'i. University of California Press. pp. 25–26. ISBN 9780520953833. ^ Wolff, John U. (2018). Proto-Austronesian Phonology with Glossary. Vol. II. Cornell Southeast Asia Program Publications. p. 927. ISBN 9781501735998. ^ "The Evolution of Plant Names". Te Mära Reo: The Language Garden. Benton Family Trust. Retrieved 15 January 2019. ^ a b c d Thomson, Lex A.J; Englberger, Lois; Guarino, Luigi; Thaman, R.R. ; Elevitch, Craig R. (2006). "Pandanus tectorius (pandanus)" (PDF). In Elevitch, Craig R. (ed.). Species Profiles for Pacific Island Agroforestry. Permanent Agriculture Resources (PAR). ^ Gurmeet, Singh; Amrita, Parle (2015). "Unique pandanus - Flavour, food and medicine" (PDF). Journal of Pharmacognosy and Phytochemistry. 5 (3): 8–14. ^ Castro, Irma Remo (2006). A Guide to Families of Common Flowering Plants in the Philippines. University of the Philippines Press. pp. 144–145. ISBN 9789715425254. ^ Wiersema, John H.; León, Blanca (2016). World Economic Plants: A Standard Reference (2nd ed.). CRC Press. ISBN 9781466576810. ^ Krishnamurthy, K.S. ; Parthasarathy, V.A. ; Saji, K.V. ; Krishnamoorthy, B. (2010). "Ideotype concept in black pepper (Piper nigrum L.)". Journal of Spices and Aromatic Crops. 19 (1 & 2): 1–13. ^ a b c d e f Zumbroich, Thomas J. (2007–2008). "The origin and diffusion of betel chewing: a synthesis of evidence from South Asia, Southeast Asia and beyond". eJournal of Indian Medicine. 1: 87–140. ^ a b c d Heathcote, Gary M.; Diego, Vincent P.; Ishida, Hajime; Sava, Vincent J. (2012). "An osteobiography of a remarkable protohistoric Chamorro man from Taga, Tinian". Micronesica. 43 (2): 131–213. ^ a b Lebot, V.; Lèvesque, J. (1989). "The Origin and Distribution of Kava (Piper methysticum Forst. F., Piperaceae): A Phytochemical Approach". Allertonia. 5 (2): 223–281. ^ Mahdi, Waruno (1999). "The Dispersal of Austronesian boat forms in the Indian Ocean" (PDF). In Blench, Roger; Spriggs, Matthew (eds.). Archaeology and Language III: Artefacts languages, and texts. One World Archaeology. 34. Routledge. p. 144–179. ISBN 978-0415100540. ^ a b c d e f g h i j Ross, Malcolm (2008). "Other cultivated plants". In Ross, Malcolm; Pawley, Andrew; Osmond, Meredith (eds.). The lexicon of Proto Oceanic: The culture and environment of ancestral Oceanic society. Volume 3: Plants. Pacific Linguistics. p. 389–426. ISBN 9780858835894. ^ Ravindran, P.N. (2017). The Encyclopedia of Herbs and Spices. CABI. ISBN 9781780643151. ^ Wiart, Christophe (2006). Medicinal Plants Of The Asia-pacific: Drugs For The Future?. World Scientific. ISBN 9789814480338. ^ a b Dalby, Andrew (2002). Dangerous Tastes: The Story of Spices. University of California Press. ISBN 9780520236745. ^ Snodgrass, Mary Ellen (2013). World Food: An Encyclopedia of History, Culture and Social Influence from Hunter Gatherers to the Age of Globalization: An Encyclopedia of History, Culture and Social Influence from Hunter Gatherers to the Age of Globalization. Sharpe Reference. ISBN 9781317451600. ^ a b c "Kawa ~ Kawakawa". Te Mära Reo: The Language Garden. Benton Family Trust. Retrieved 15 January 2019. ^ a b "*Kava ~ *Kavakava". Te Mära Reo: The Language Garden. Benton Family Trust. Retrieved 15 January 2019. ^ a b c d Lynch, John (2002). "Potent Roots and the Origin of kava". Oceanic Linguistics. 41 (2): 493–513. doi:10.1353/ol.2002.0010. ^ Blust, Robert (1984–1985). "The Austronesian Homeland: A Linguistic Perspective". Asian Perspectives. 26 (1): 44–67. ^ Adelaar, Alexander (2016). "Austronesians in Madagascar: A Critical Assessment of the Works of Paul Ottino and Philippe Beaujard". In Campbell, Gwyn (ed.). Early Exchange between Africa and the Wider Indian Ocean World. Palgrave Series in Indian Ocean World Studies. Palgrave Macmillan. pp. 77–112. ISBN 9783319338224. ^ a b Whistler, W. Arthur; Elevitch, Craig R. (2006). "Syzygium malaccense (Malay apple) (beach hibiscus)" (PDF). In Elevitch, Craig R. (ed.). Traditional Trees of Pacific Islands: Their Culture, Environment, and Use. Permanent Agricultural Resources (PAR). pp. 41–56. ISBN 9780970254450. ^ Dotte-Sarout, Emilie (2016). "Evidence of forest management and arboriculture from wood charcoal data: an anthracological case study from two New Caledonia Kanak pre-colonial sites". Vegetation History and Archaeobotany. 26 (2): 195–211. doi:10.1007/s00334-016-0580-0. ^ a b c Farley, Gina; Schneider, Larissa; Clark, Geoffrey; Haberle, Simon G. (December 2018). "A Late Holocene palaeoenvironmental reconstruction of Ulong Island, Palau, from starch grain, charcoal, and geochemistry analyses". Journal of Archaeological Science: Reports. 22: 248–256. doi:10.1016/j.jasrep.2018.09.024. ^ Spennemann, Dirk H.R. (1994). "Traditional Arrowroot Production and Utilization in the Marshall Islands". Journal of Ethnobiology. 14 (2): 211–234. ^ Thaman, R.R. (1994). "Ethnobotany of the Pacific Island Coastal Plains". In Morrison, John; Geraghty, Paul; Crowl, Linda (eds.). Fauna, Flora, Food and Medicine: Science of Pacific Island Peoples. Volume 3. Institute of Pacific Studies. pp. 147–184. ISBN 9789820201064. ^ a b c Prebble, Matiu; Anderson, Atholl (2012). "The archaeobotany of Rapan rockshelter deposits" (PDF). In Anderson, Atholl; Kennett, Douglas J. (eds.). Taking the High Ground: The archaeology of Rapa, a fortified island in remote East Polynesia. terra australis. 37. ANU E Press. pp. 77–95. ISBN 9781922144256. ^ a b c Dotte-Sarout, Emilie; Kahn, Jennifer G. (November 2017). "Ancient woodlands of Polynesia: A pilot anthracological study on Maupiti Island, French Polynesia". Quaternary International. 457: 6–28. doi:10.1016/j.quaint.2016.10.032. ^ Elevitch, Craig R.; Thomson, Lex A.J. (2006). "Hibiscus tiliaceus (beach hibiscus)" (PDF). In Elevitch, Craig R. (ed.). Traditional Trees of Pacific Islands: Their Culture, Environment, and Use. Permanent Agricultural Resources (PAR). pp. 41–56. ISBN 9780970254450. ^ "*Milo". Te Mära Reo: The Language Garden. Benton Family Trust. Retrieved 22 January 2019. ^ Ujang, Zanariah; Nordin, Nurul Izza; Subramaniam, Thavamanithevi (December 2015). "Ginger Species and Their Traditional Uses in Modern Applications". Journal of Industrial Technology. 23 (1): 59–70. doi:10.21908/jit.2015.4. ^ Ravindran, P.N. ; Pillai, Geetha S.; Babu, K. Nirmal (2004). "Under-utilized herbs and spices". In Peter, K.V. (ed.). Handbook of Herbs and Spices. Volume 2. Woodhead Publishing. ISBN 9781855737211. ^ Cheng, Lancini Jen-Hao (2014). Taxonomies of Taiwanese Aboriginal Musical Instruments (PDF) (PhD). University of Otago. ^ a b c d e Kikusawa, Ritsuko; Reid, Lawrence A. (2007). "Proto who utilized turmeric, and how?" (PDF). In Siegel, Jeff; Lynch, John; Eades, Diana (eds.). Language Description, History and Development: Linguistic indulgence in memory of Terry Crowley. John Benjamins Publishing Company. pp. 339–352. ISBN 9789027292940. ^ McClatchey, W. (1993). "Traditional use of Curcuma longa (Zingiberaceae) in Rotuma". Economic Botany. 47 (3): 291–296. doi:10.1007/bf02862297. ^ Viestad, Andreas (2007). Where Flavor Was Born: Recipes and Culinary Travels Along the Indian Ocean Spice Route. Chronicle Books. p. 89. ISBN 9780811849654. ^ Ravindran, P.N. ; Nirmal Babu, K. (2016). Ginger: The Genus Zingiber. CRC Press. p. 7. ISBN 9781420023367. ^ Allaby, Robin (2007). "Origins of Plant Exploitation in Near Oceania: A Review". In Friedlaender, Jonathan S. (ed.). Genes, Language, & Culture History in the Southwest Pacific. Human Evolution Series. Oxford University Press. p. 191. ISBN 9780198041085. ^ a b c d Fillios, Melanie A.; Taçon, Paul S.C. (2016). "Who let the dogs in? A review of the recent genetic evidence for the introduction of the dingo to Australia and implications for the movement of people". Journal of Archaeological Science: Reports. 7: 782–792. doi:10.1016/j.jasrep.2016.03.001. ^ a b c Bulmer, Susan (2001). "Lapita dogs and singing dogs and the history of the dog in New Guinea". In Clark, Geoffrey Richard; Anderson, Atholl; Vunidilo, Tarisi (eds.). The Archaeology of Lapita Dispersal in Oceania: Papers from the Fourth Lapita Conference, June 2000, Canberra, Australia. Pandanus Books. pp. 183–202. ISBN 9781740760102. ^ a b c Greig, Karen; Boocock, James; Prost, Stefan; Horsburgh, K. Ann; Jacomb, Chris; Walter, Richard; Matisoo-Smith, Elizabeth; Kayser, Manfred (2015). "Complete Mitochondrial Genomes of New Zealand's First Dogs". PLOS ONE. 10 (10): e0138536. doi:10.1371/journal.pone.0138536. PMID 26444283. ^ a b O'Connor, Sue; Mahirta; Tanudirjo, Daud; Ririmasse, Marlon; Husni, Muhammad; Kealy, Shimona; Hawkins, Stuart; Alifah (4 December 2017). "Ideology, Ritual Performance and Its Manifestations in the Rock Art of Timor-Leste and Kisar Island, Island Southeast Asia". Cambridge Archaeological Journal. 28 (2): 225–241. doi:10.1017/S0959774317000816. ^ a b c Greig, Karen; Boocock, James; Allen, Melinda S.; Matisoo-Smith, Elizabeth; Walter, Richard (2018). "Ancient DNA Evidence for the Introduction and Dispersal of Dogs (Canis familiaris) in New Zealand". Journal of Pacific Archaeology. 9 (1): 1–10. ^ a b c Sacks, Benjamin N.; Brown, Sarah K.; Stephens, Danielle; Pedersen, Niels C.; Wu, Jui-Te; Berry, Oliver (2013). "Y Chromosome Analysis of Dingoes and Southeast Asian Village Dogs Suggests a Neolithic Continental Expansion from Southeast Asia Followed by Multiple Austronesian Dispersals". Molecular Biology and Evolution. 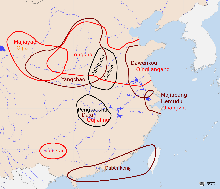 30 (5): 1103–1118. doi:10.1093/molbev/mst027. PMID 23408799. ^ Savolainen, Peter; Leitner, Thomas; Wilton, Alan N.; Matisoo-Smith, Elizabeth; Lundeberg, Lundeberg (6 August 2004). "A detailed picture of the origin of the Australian dingo, obtained from the study of mitochondrial DNA". Proceedings of the National Academy of Sciences. 101 (33): 12387–12390. doi:10.1073/pnas.0401814101. PMC 514485. PMID 15299143. ^ a b Ardalan, Arman; Oskarsson, Mattias C.R. ; van Asch, Barbara; Rabakonandriania, Elisabeth Rabakonandriania; Savolainen, Peter (2015). "African origin for Madagascan dogs revealed by mtDNA analysis". Royal Society Open Science. 2 (5): 140552. doi:10.1098/rsos.140552. PMC 4453261. PMID 26064658. ^ a b van Asch, Barbara (12 June 2015). "Madagascan dogs hail from Africa, unlike their human counterparts". The Conversation. The Conversation Media Group Ltd. Retrieved 15 January 2019. ^ a b Piper, Philip J. (2017). "The Origins and Arrival of the Earliest Domestic Animals in Mainland and Island Southeast Asia: A Developing Story of Complexity". In Piper, Philip J.; Matsumura, Hirofumi; Bulbeck, David (eds.). New Perspectives in Southeast Asian and Pacific Prehistory. terra australis. 45. ANU Press. ISBN 9781760460945. This page was last edited on 7 April 2019, at 08:24 (UTC).